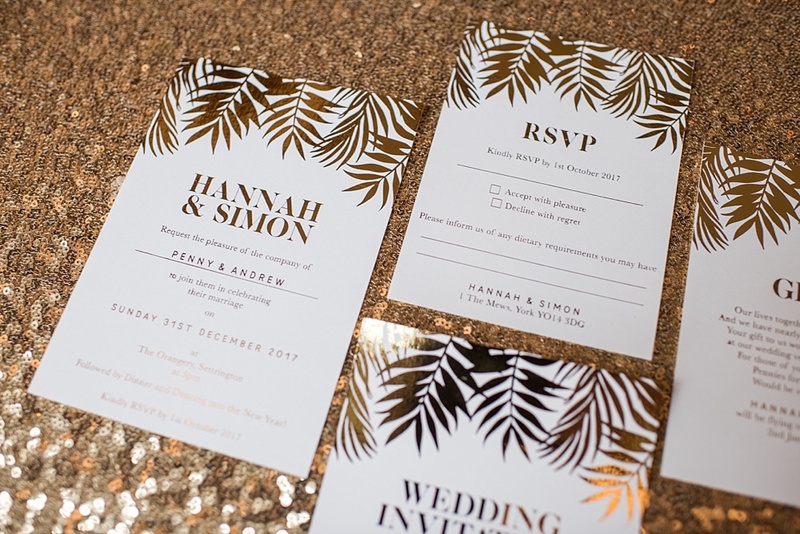 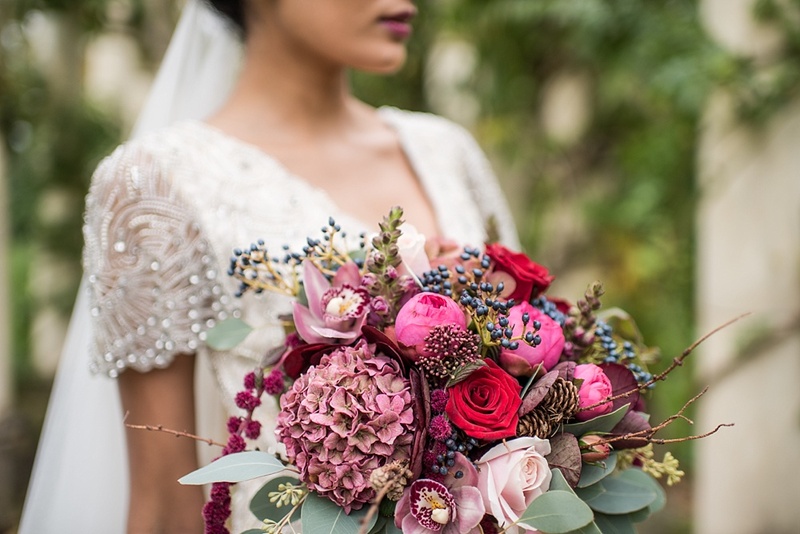 We may be desperately trying to shake off the current cold season and focus on the brighter months ahead, but we’re finishing the week with a truly delectable dose of winter wedding inspiration. 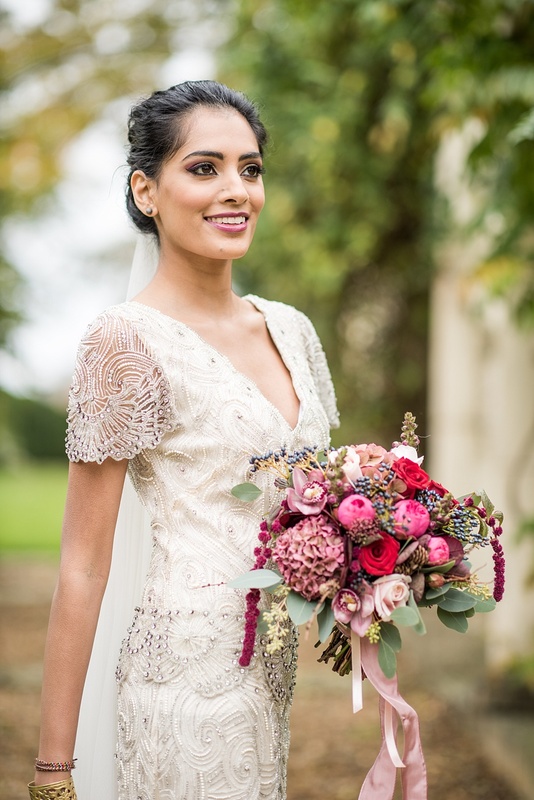 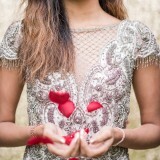 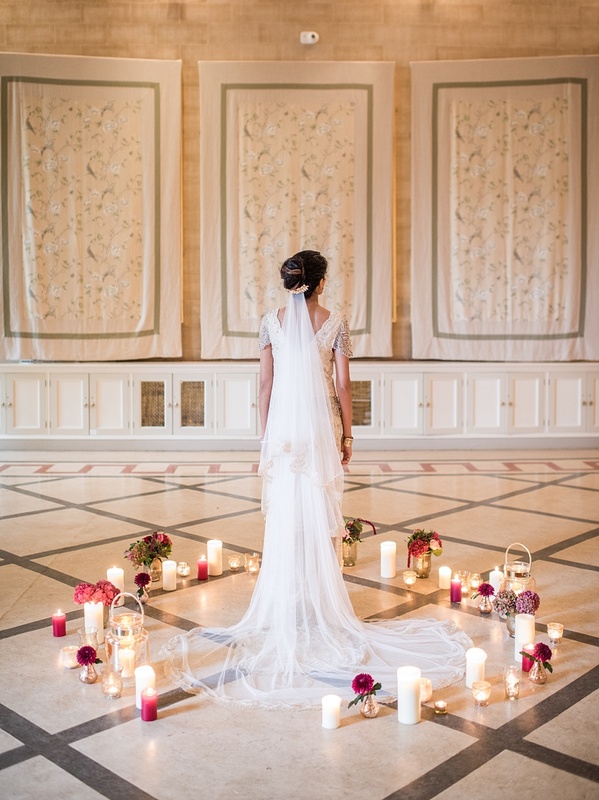 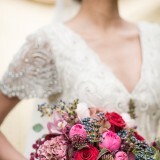 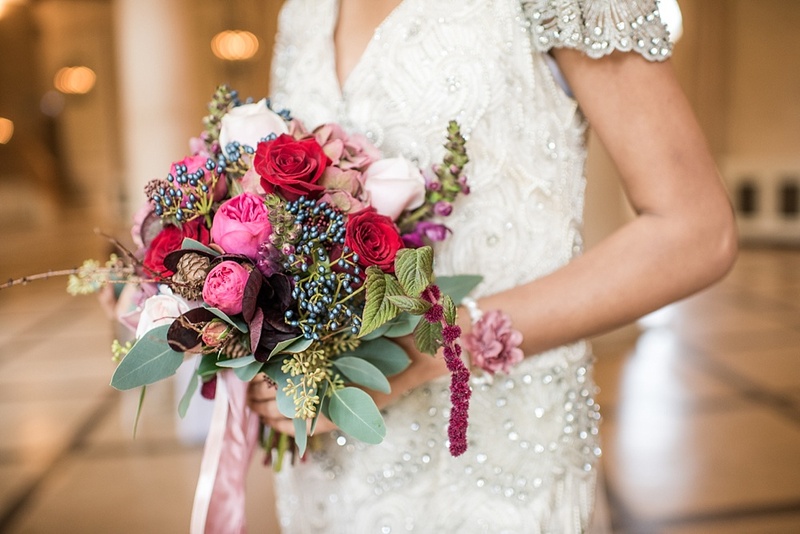 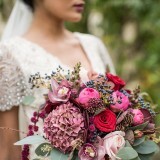 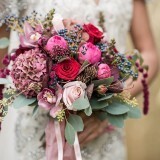 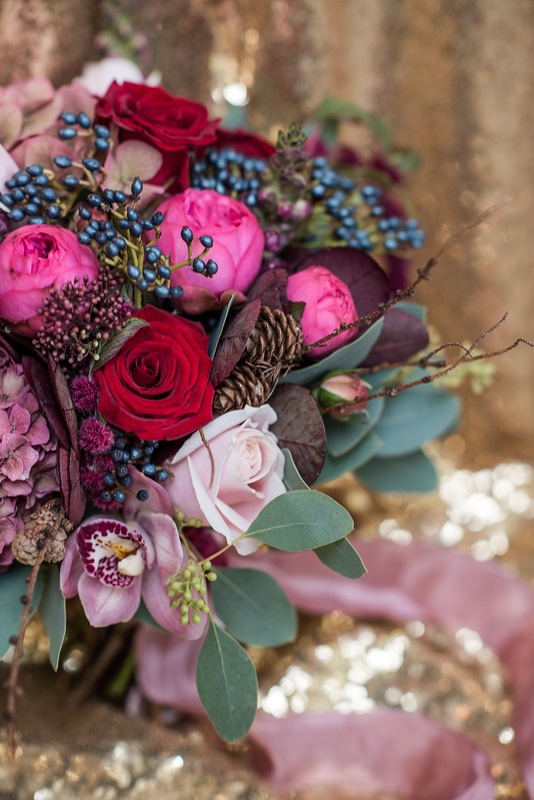 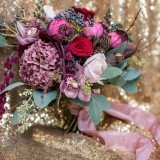 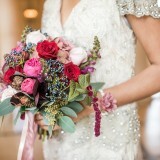 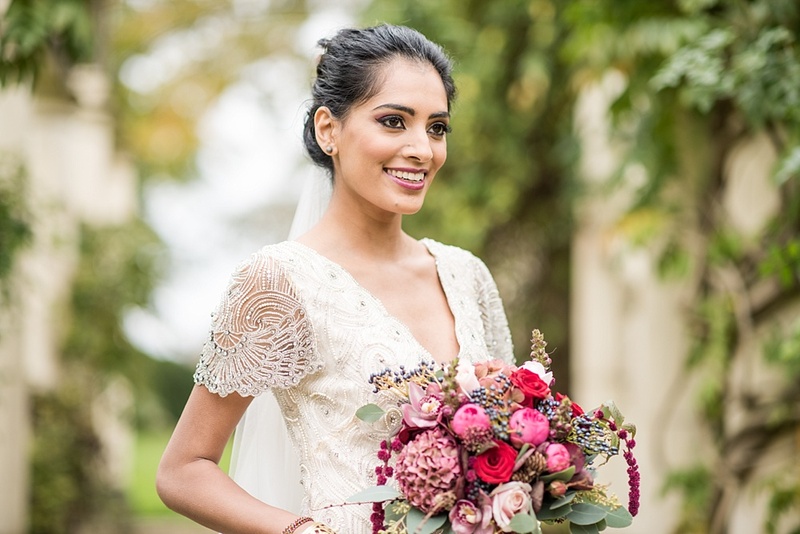 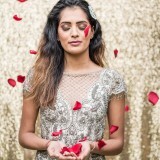 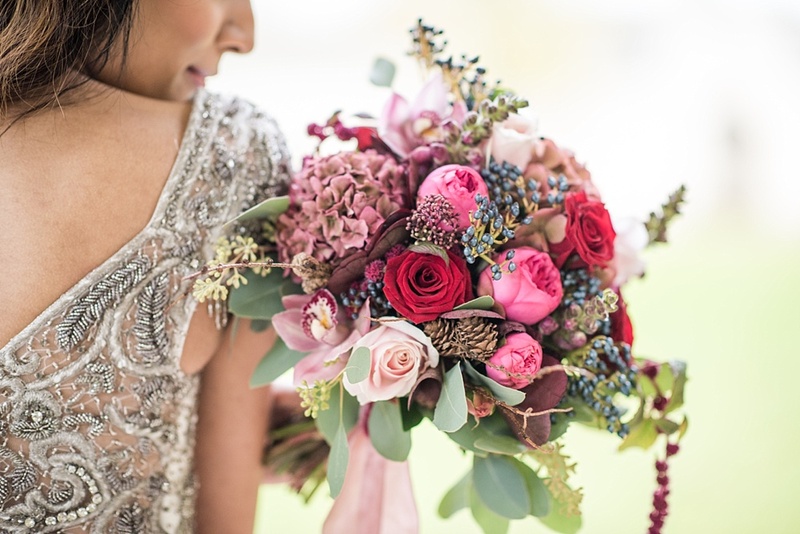 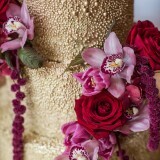 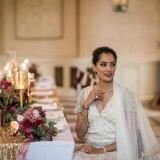 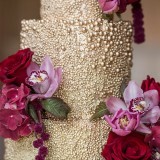 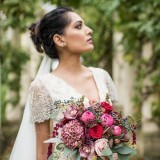 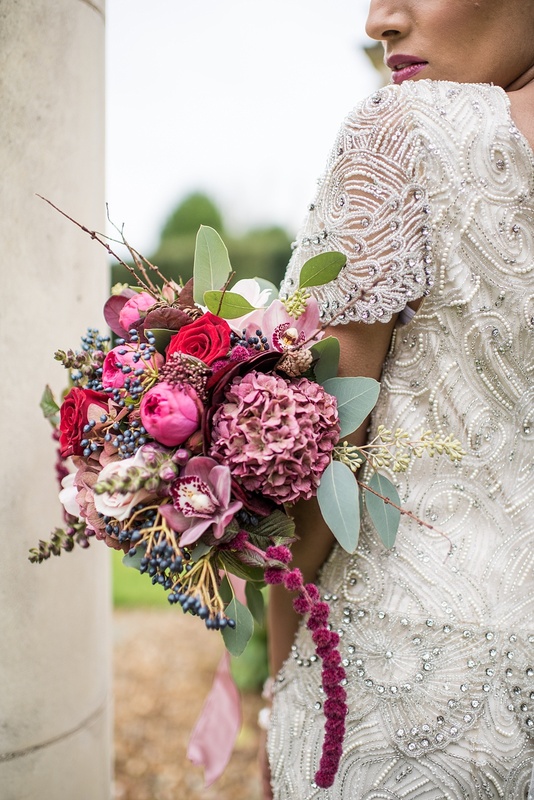 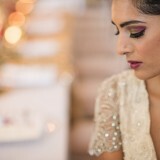 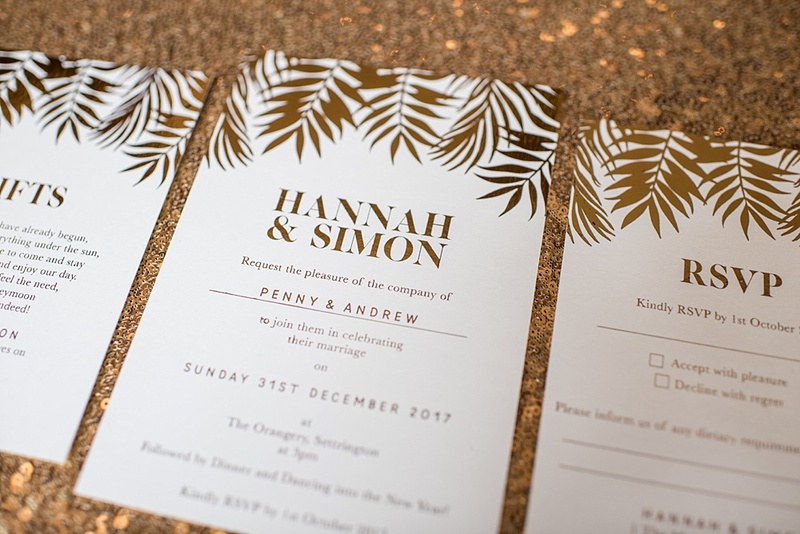 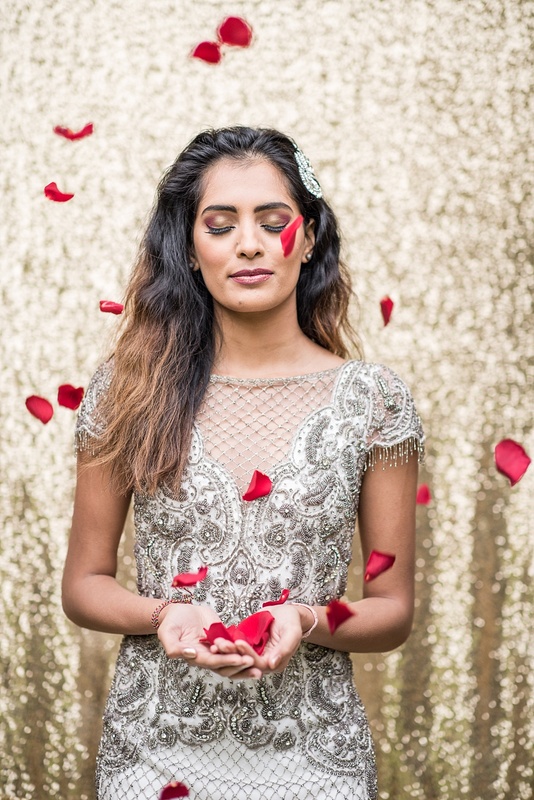 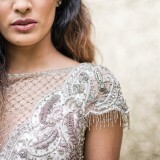 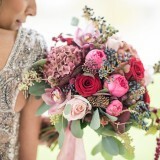 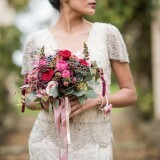 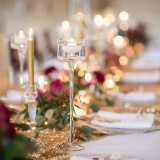 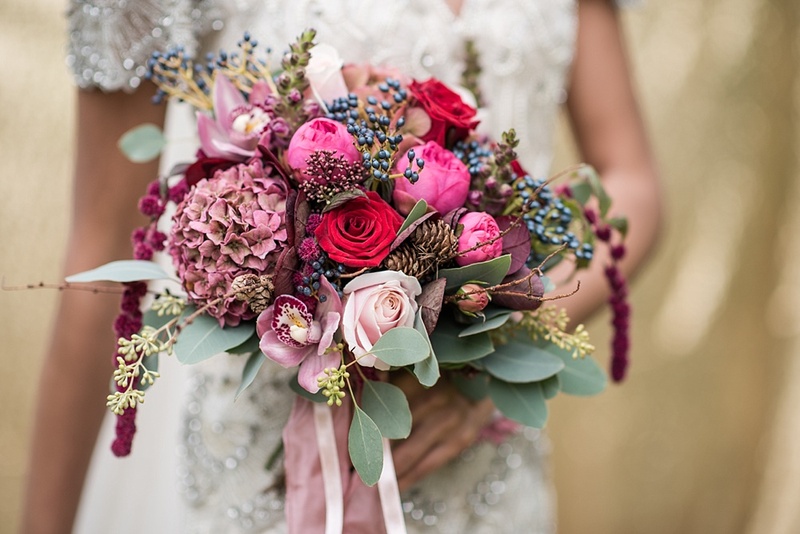 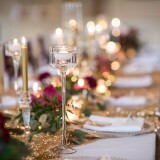 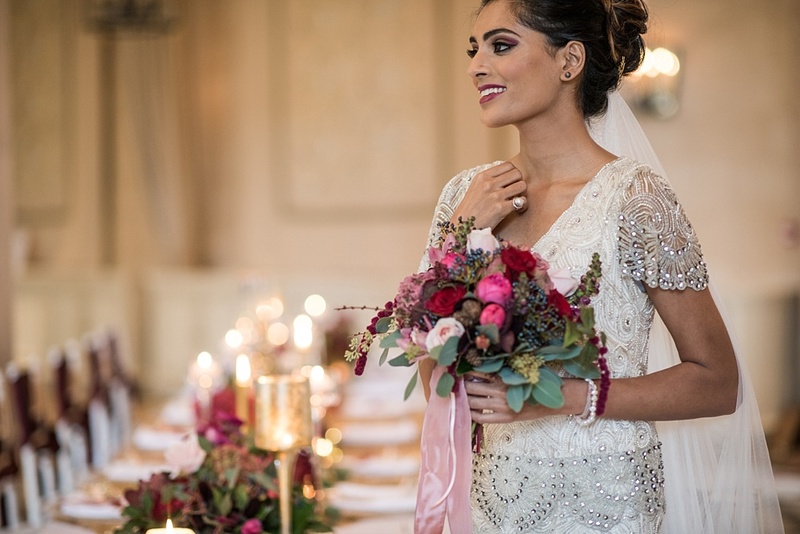 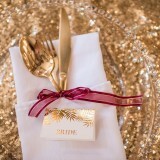 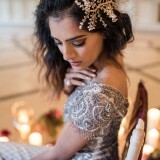 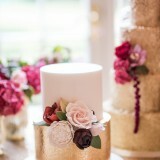 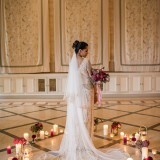 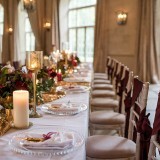 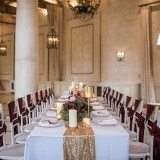 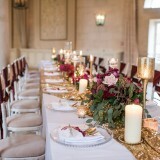 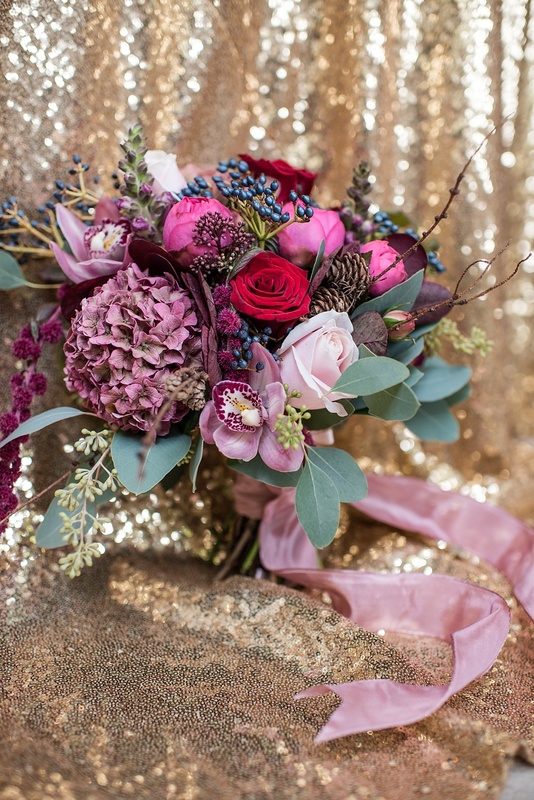 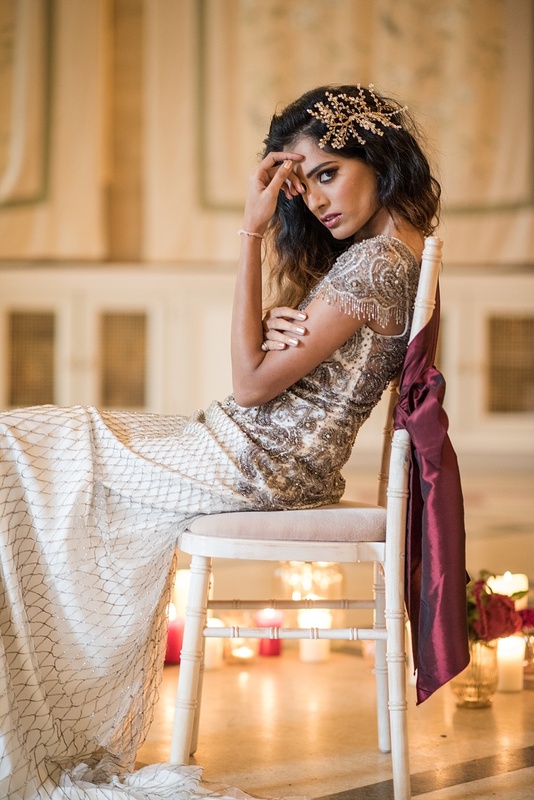 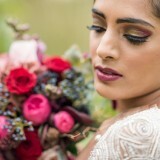 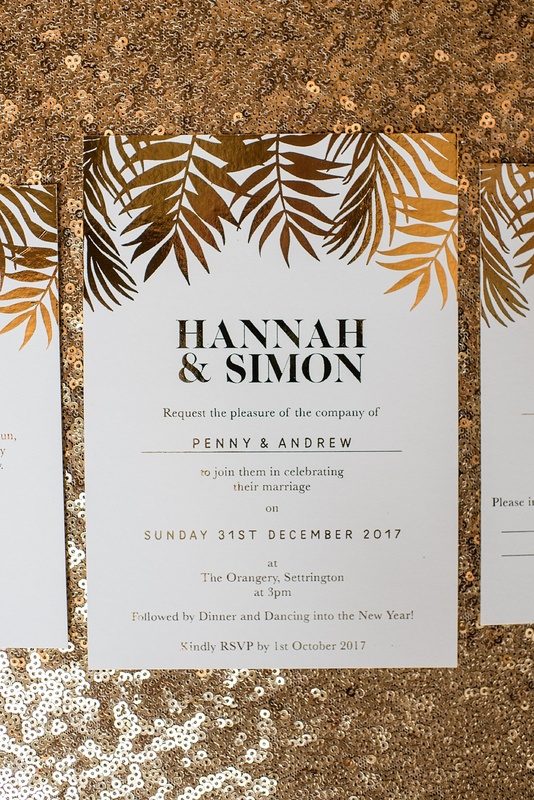 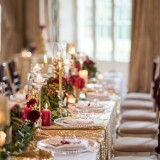 Those of you planning your wedding for such time of year are certainly going to want to have your Pinning-fingers at the ready, as this shoot epitomises an opulent winter wedding at its finest, complete with a warming palette of golds and berry reds, plus plenty of crystal and jewel detailing. 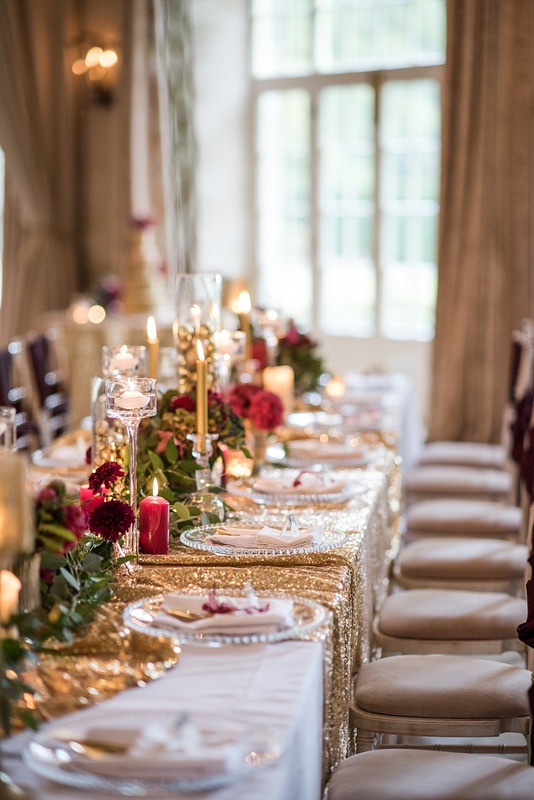 Engineered by a talented group of Yorkshire suppliers, the shoot, captured late last year, took some of its inspiration from festive season and shows how utterly gorgeous an alternative Christmas wedding can be – thankfully there’s not a single candy cane in sight! 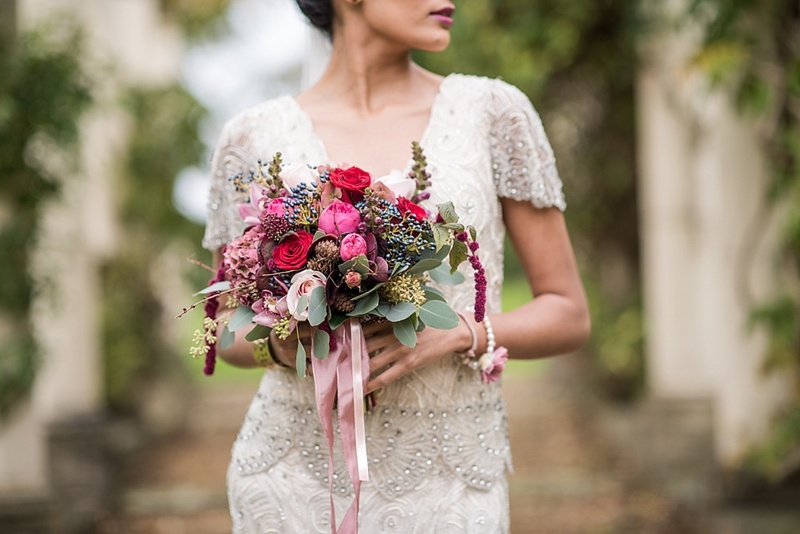 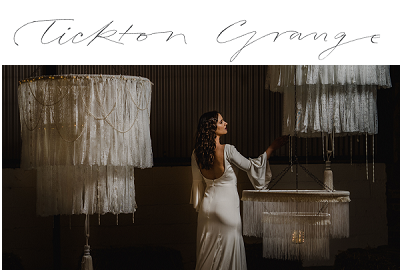 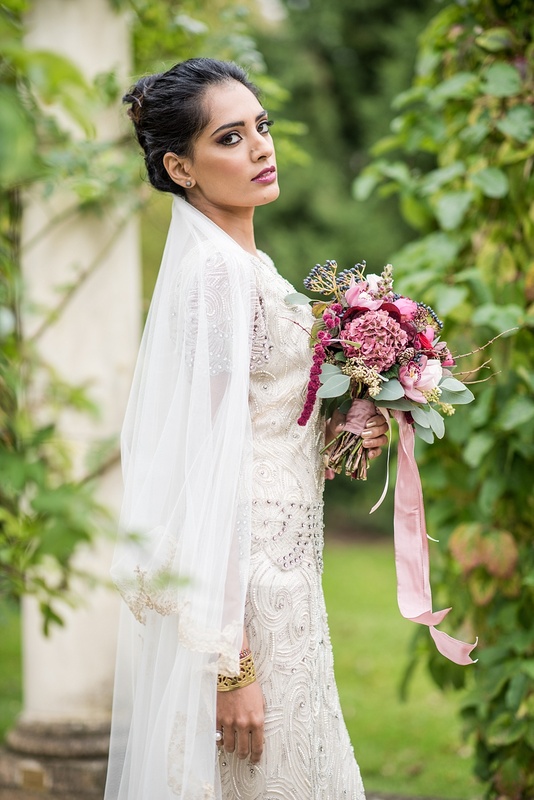 Here to tell us more is the award-winning Betty Timbo of Bespoke Vintage Castle, who made the beautiful accessories featured in the shoot – including a rather gorgeous clutch bag that us magpies at Brides Up North just love! 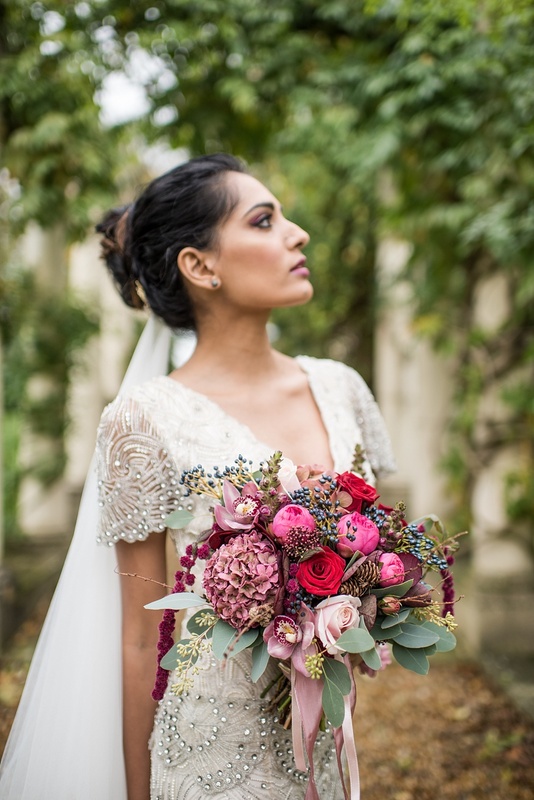 betty says: The shoot was inspired by all things seasonal and wonderful, full of rich vibrancy, opulent flowers and exciting glittery elements. 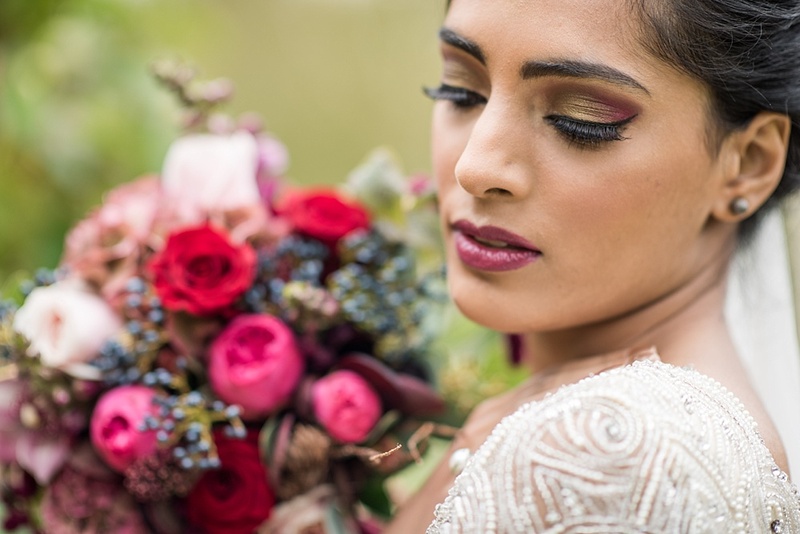 A jubilant collection of colours, moods and textures were evoked by the Christmas spirit with the shoot taking place late last year. 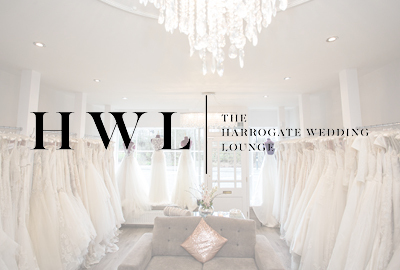 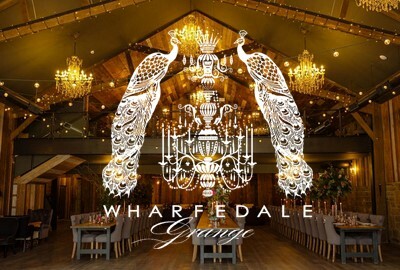 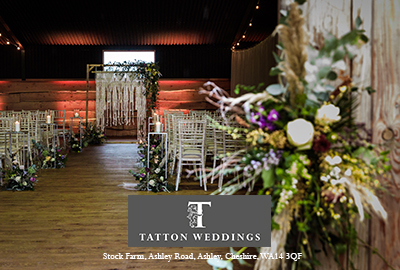 We were also keen to showcase the very best Yorkshire talent and what a wedding could be like when this theme comes together. 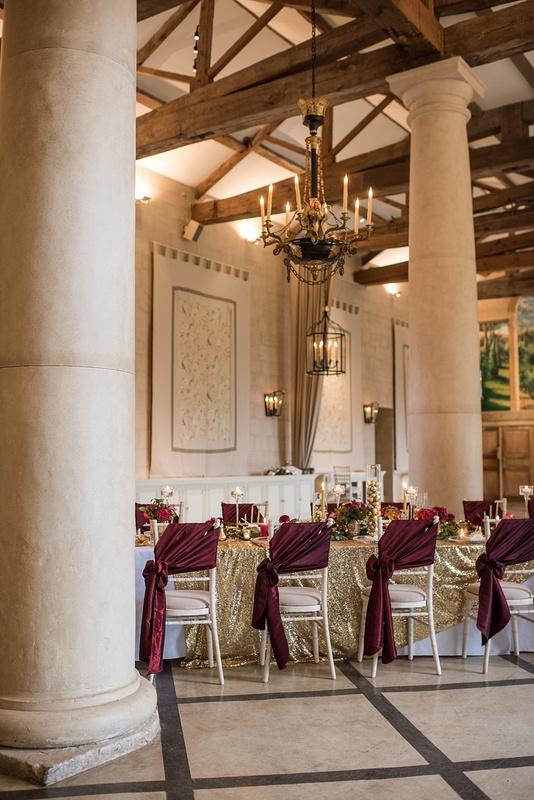 The location – The Orangery at Settrington – was perfectly chosen by photographer Jane Beadnell, who wanted to capture a place with bold structure, clean colours and a decadent finish. 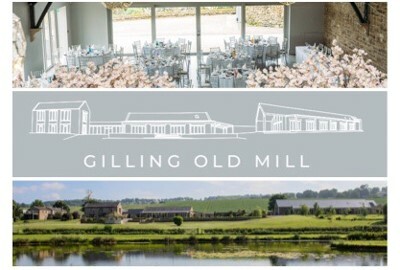 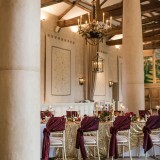 We loved the venue’s large windows that drew in the cooling winter sun, stunning pillars that shaped the room and the warming glow of the muted colour palette. 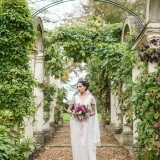 We were free to roam the grounds and were met with beautiful leafy arches, artistic sculptures and marble structures. 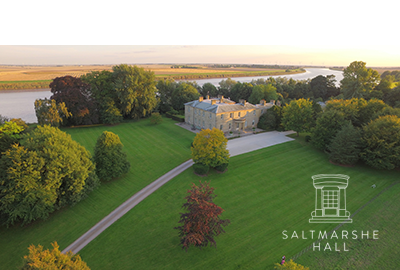 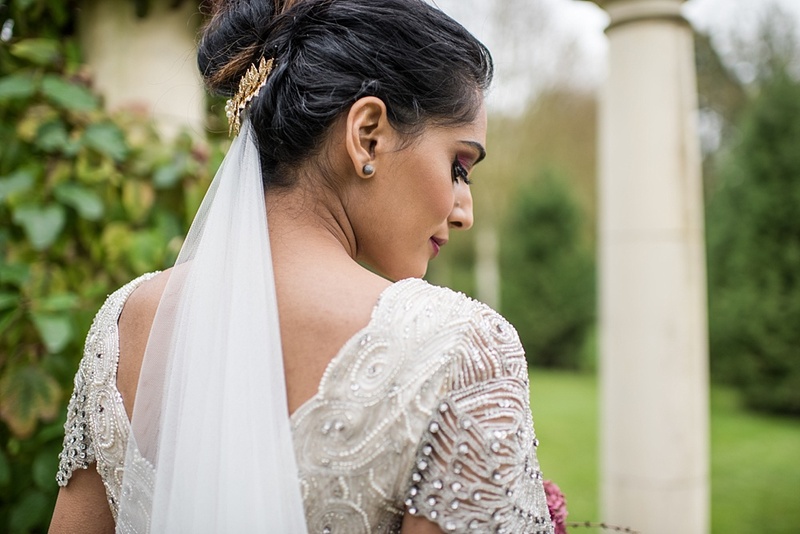 The Orangery at Settrington is a beautiful location in all seasons and we really wanted to showcase all its art, beauty and refinement in our finished images. 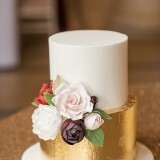 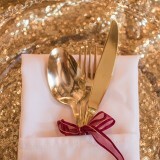 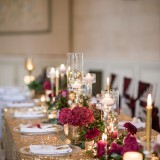 The decoration was beautifully designed and put together by Laura from Ambience Venue Styling in York. 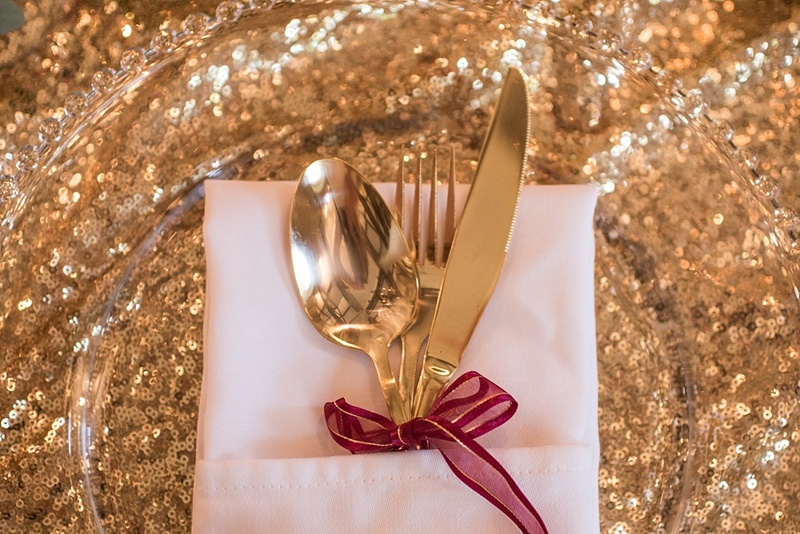 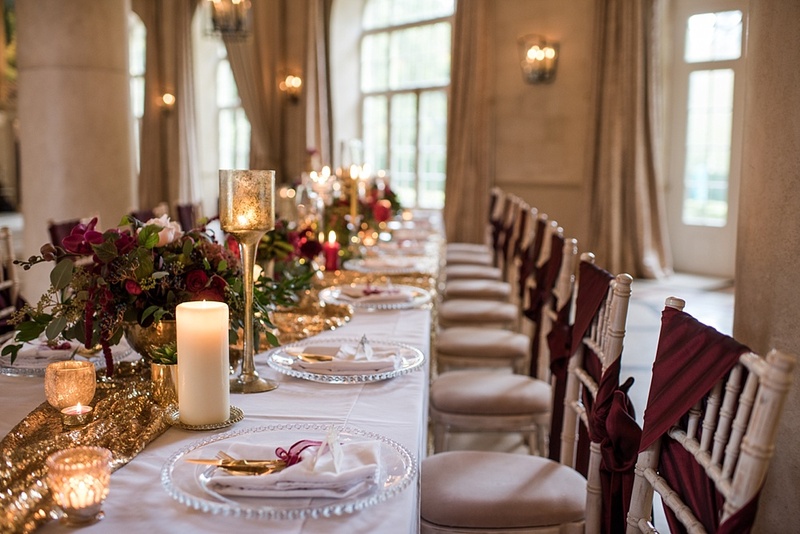 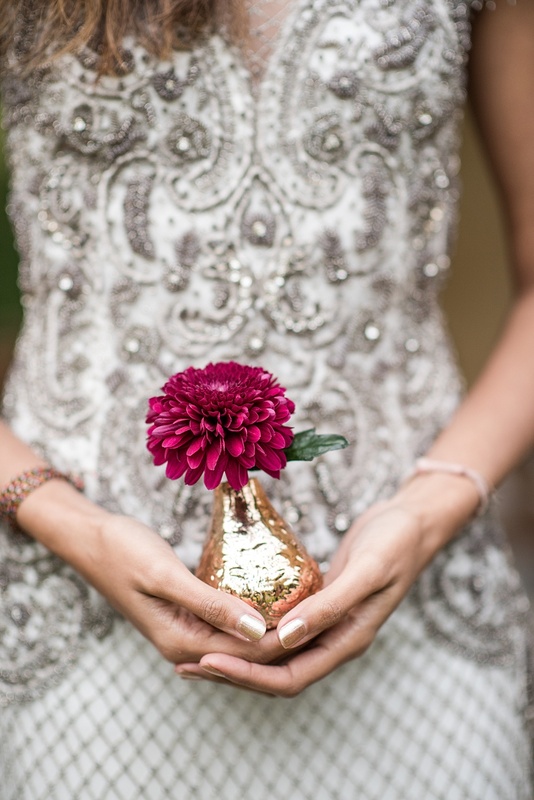 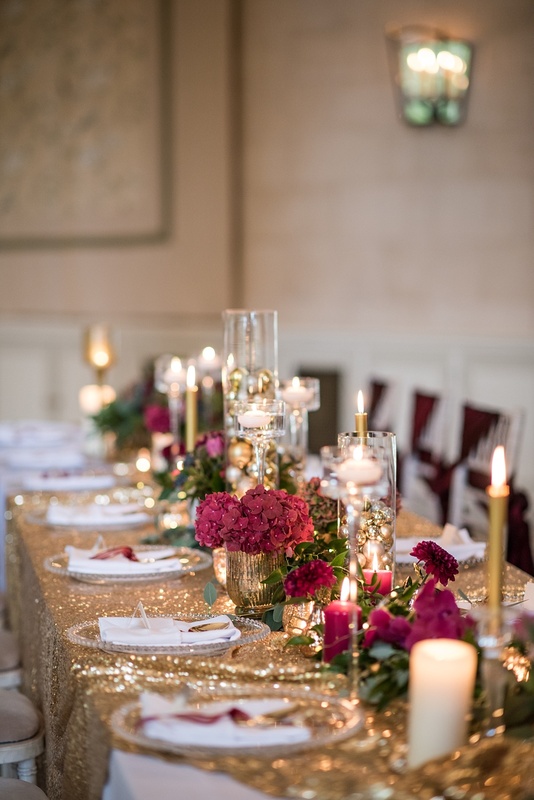 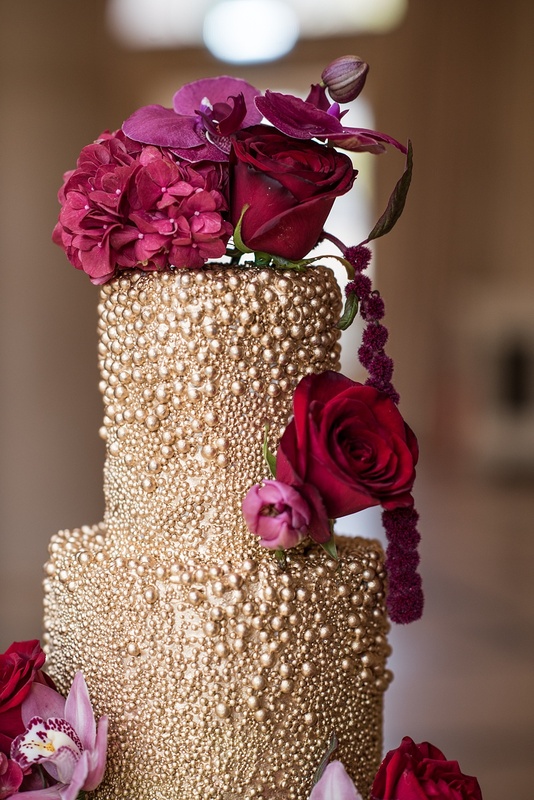 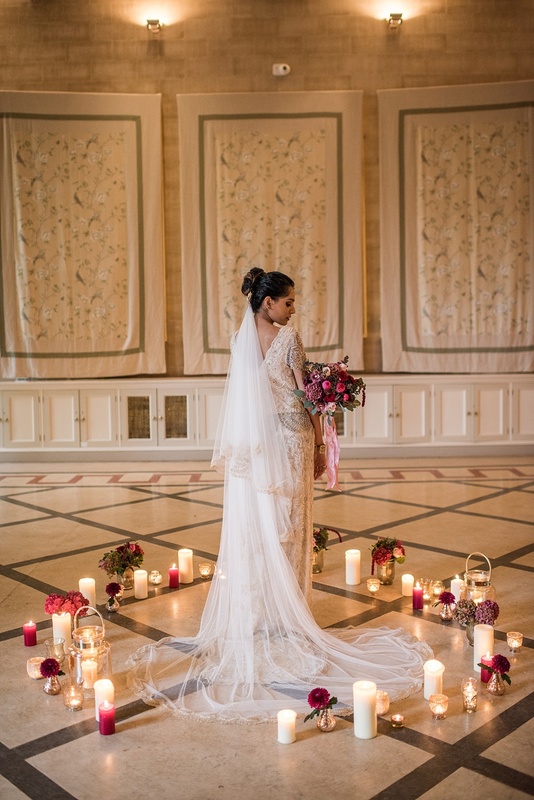 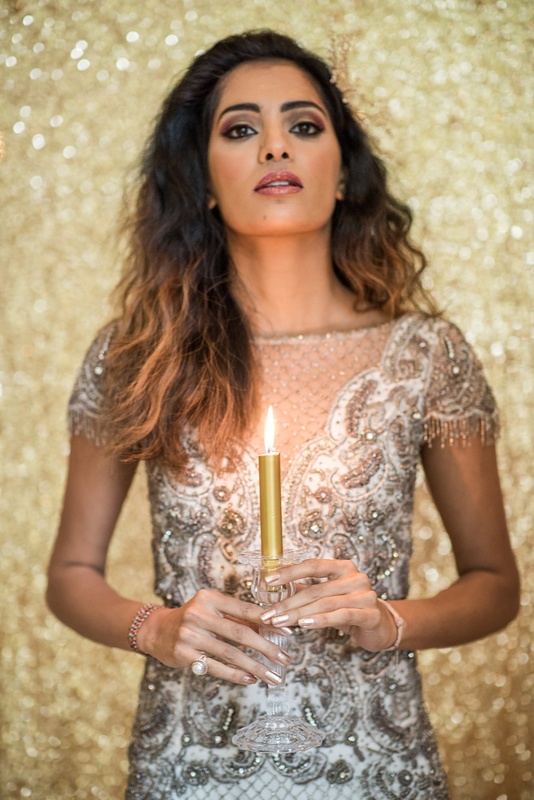 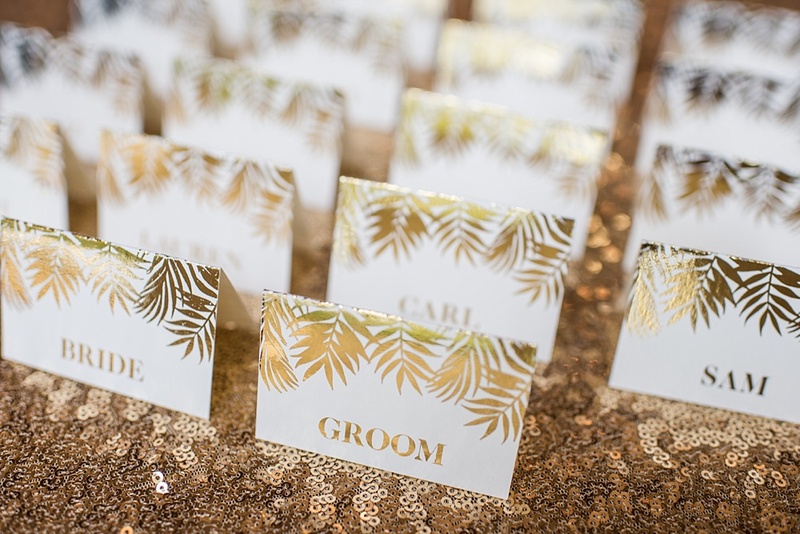 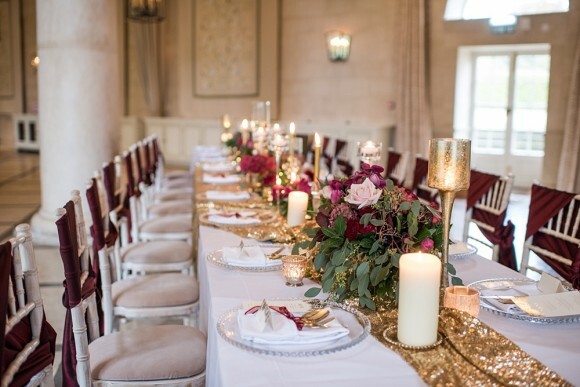 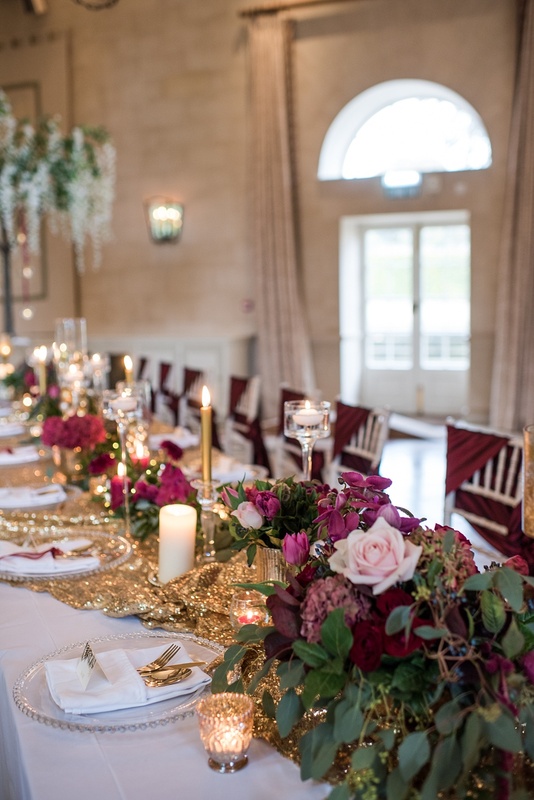 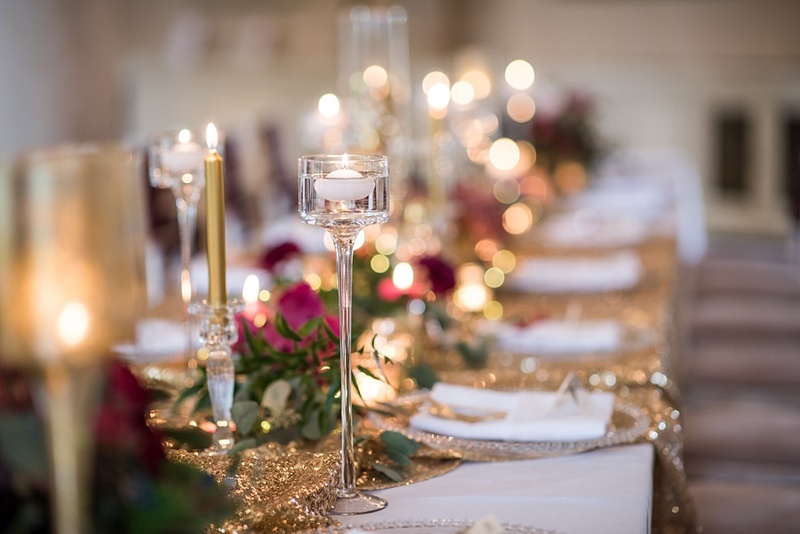 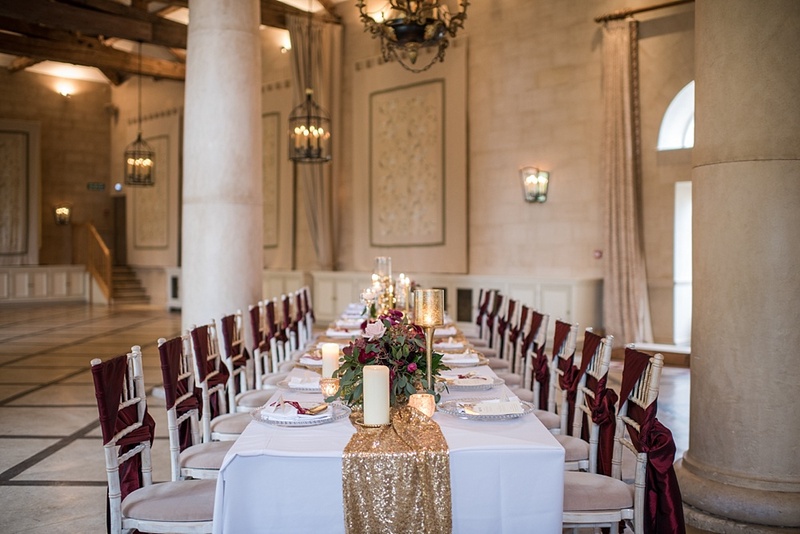 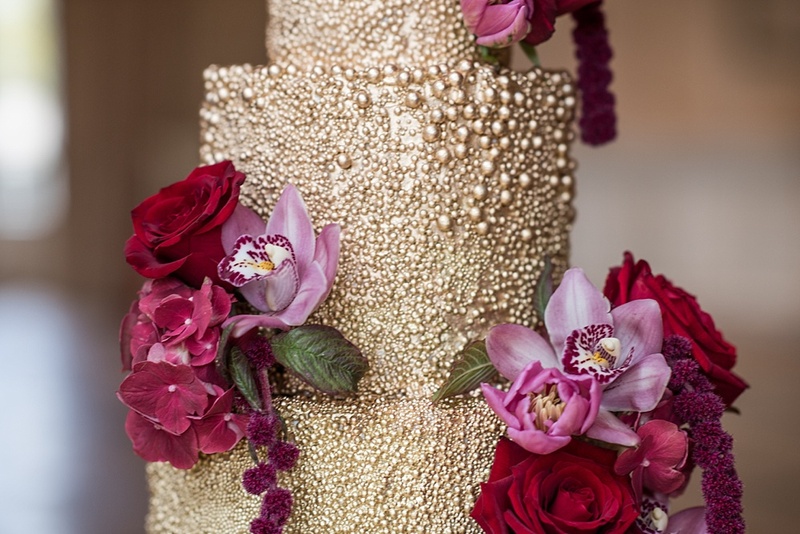 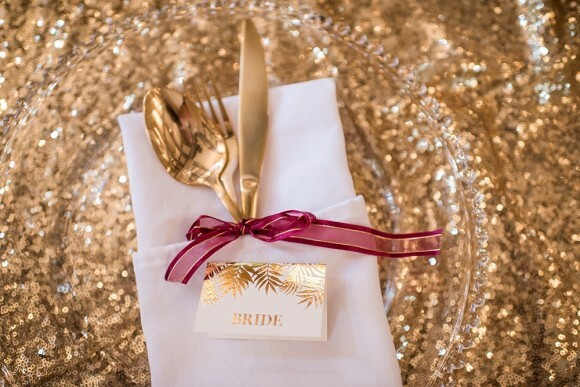 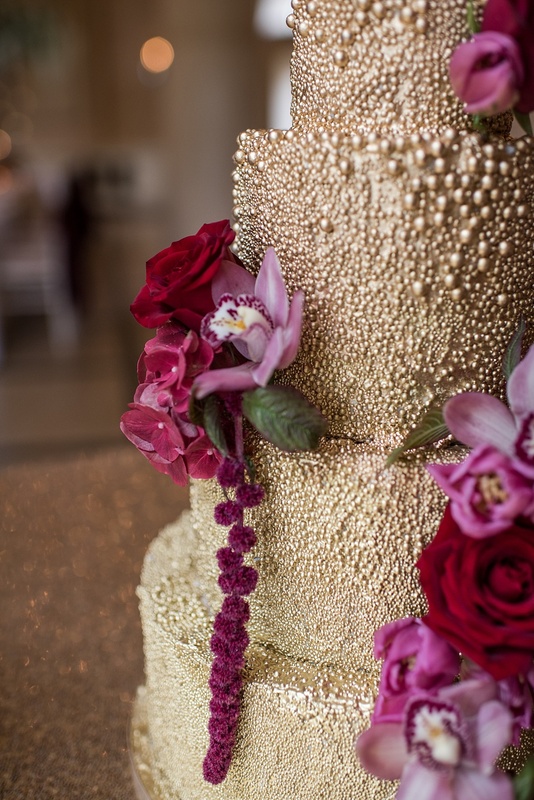 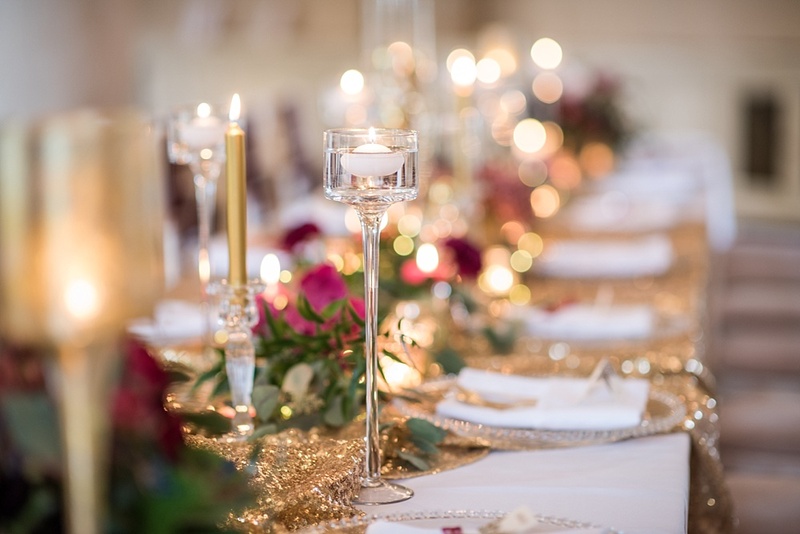 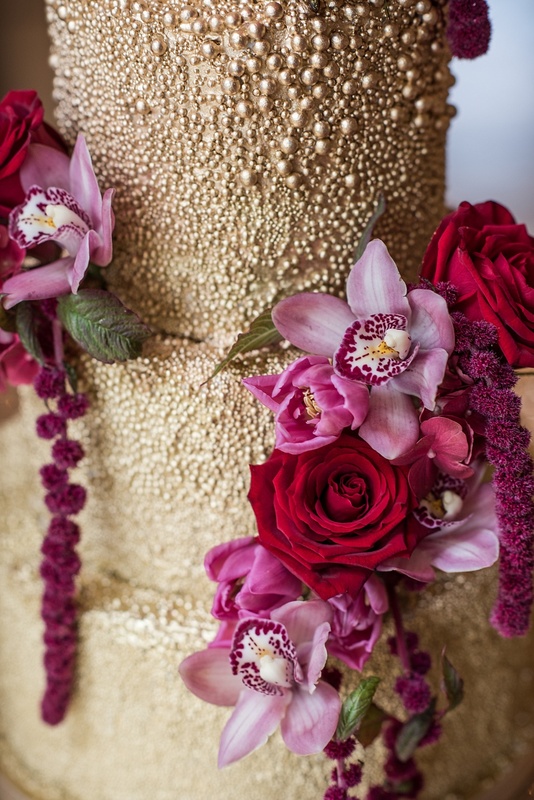 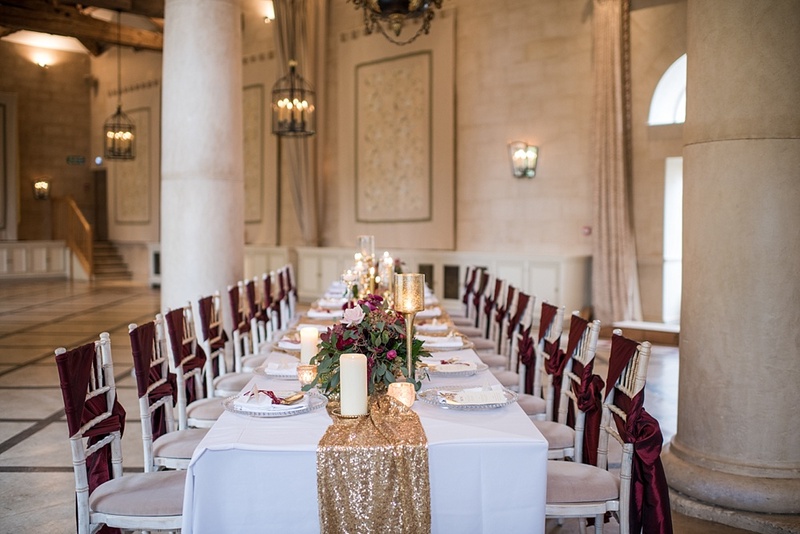 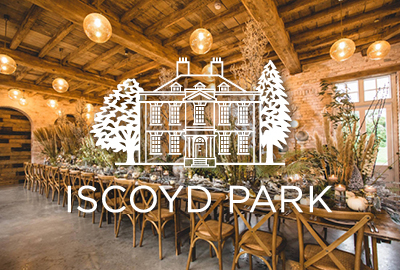 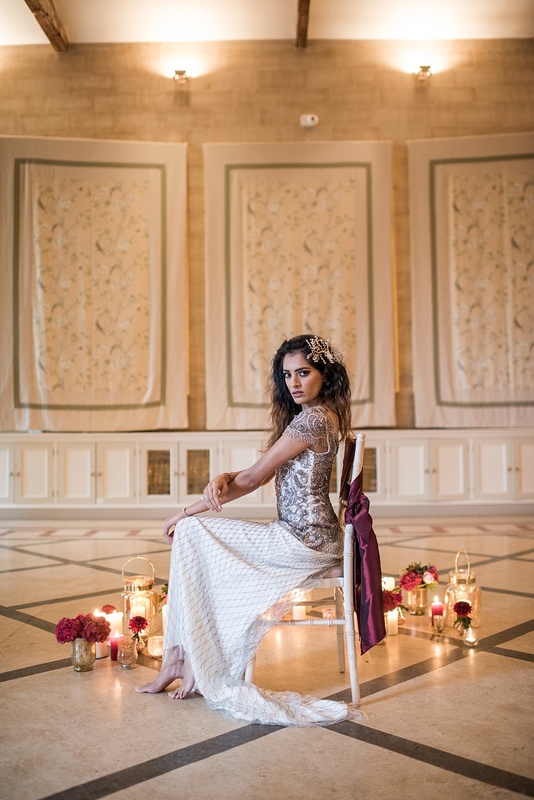 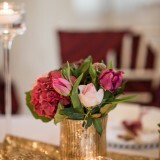 The team worked with a rich, opulent burgundy, gold and red tonal colour palette and there were tables laden with scented candles, extravagant golden cutlery and sequined tablecloths. 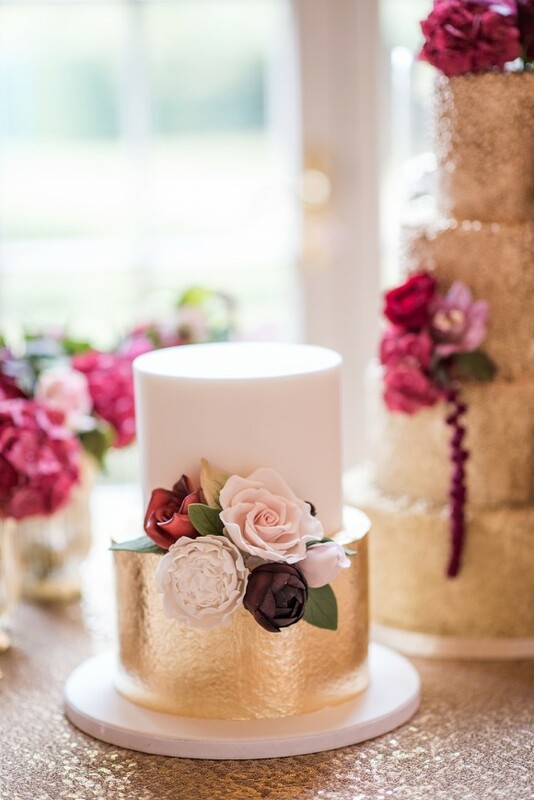 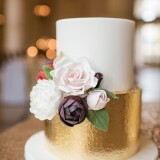 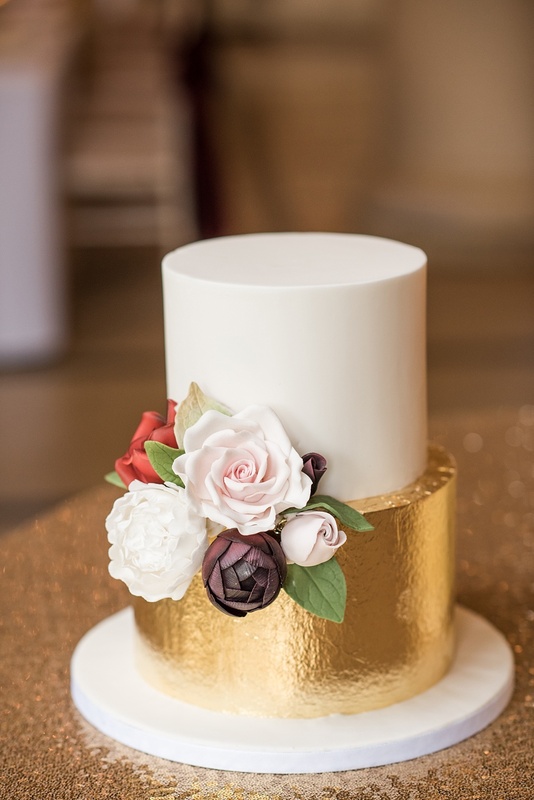 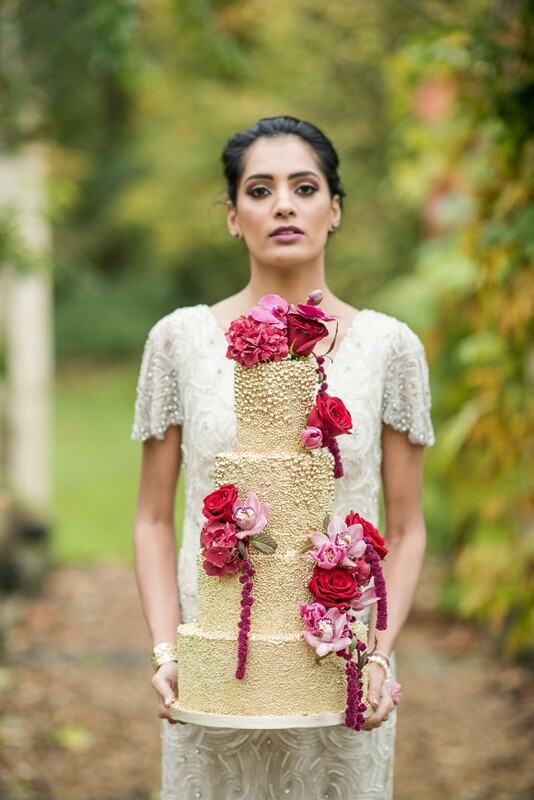 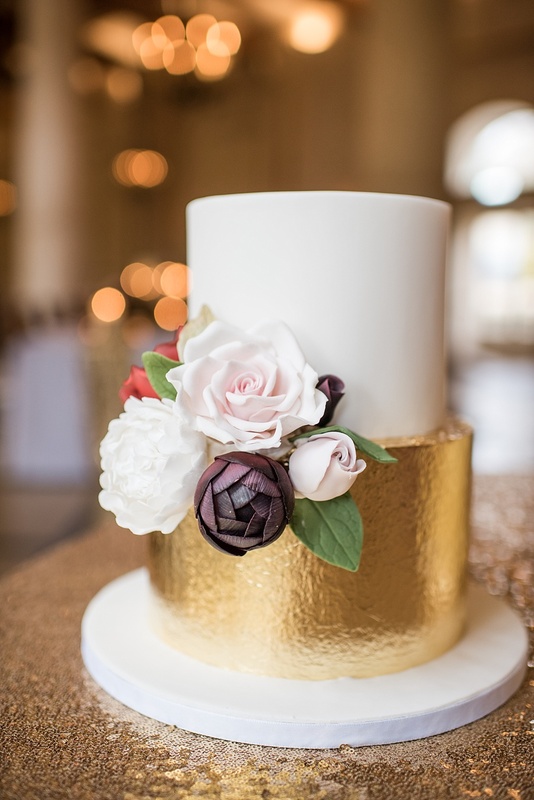 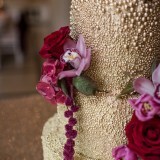 The stunning cakes by Zoe’s Fancy Cakes echoed the colour theme and were each hand-adorned with colours and breath-taking artwork. 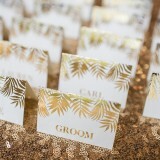 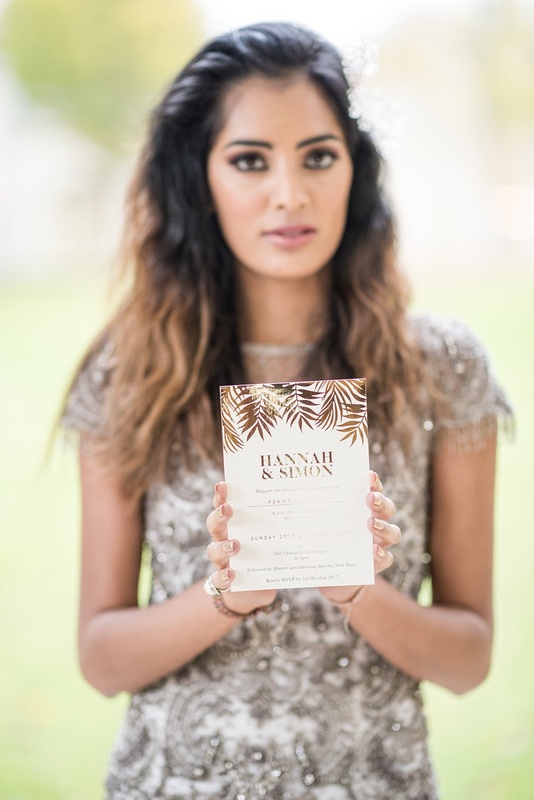 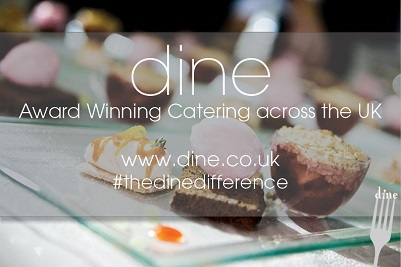 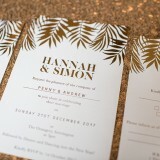 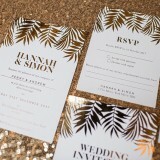 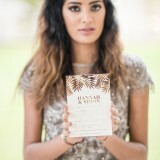 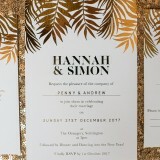 JB Creatives provided the lovely bespoke stationery in keeping with the theme. 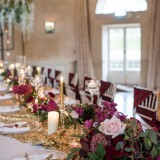 Flower details to match were created by Leafy Couture, who crafted exquisite floral designs and table centrepieces that were rich in colour with wonderful textures and emitted all the floral delights and scents of Christmas magic. 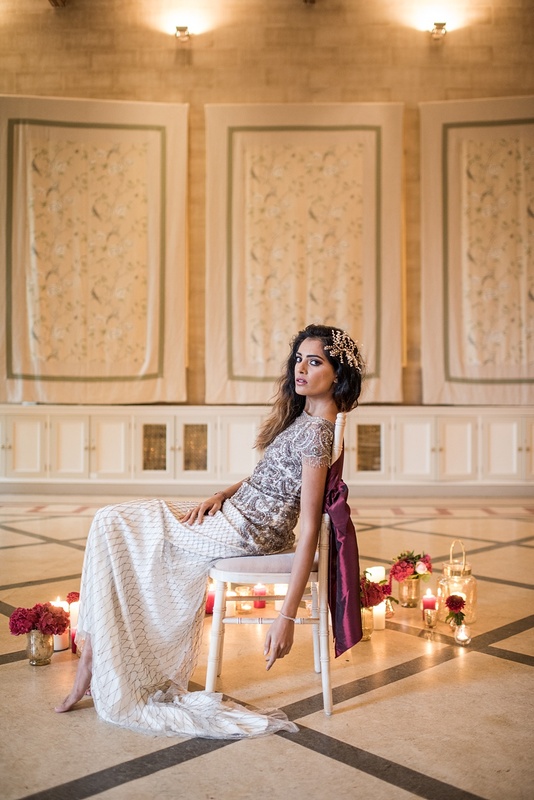 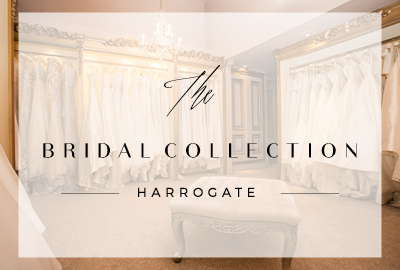 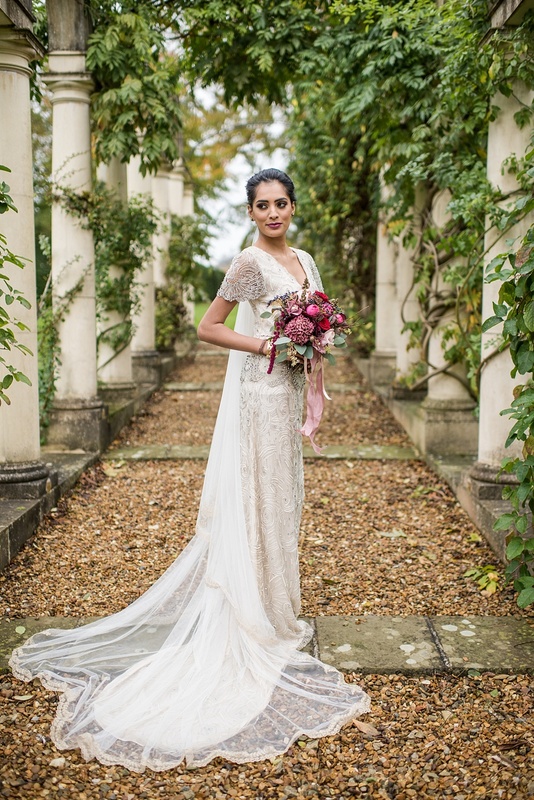 Dresses were provided by the wonderful Bridal Emporium, well known for their modern bridal gowns and trendy designs. 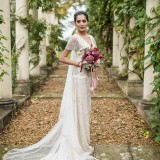 They didn’t fail to impress, as they brought along the most elegant and graceful Eliza Jane Howell gowns. 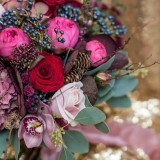 They were richly encrusted with jewels and set on fabric that moved and swayed as gently as the winter air. 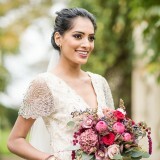 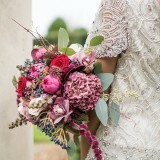 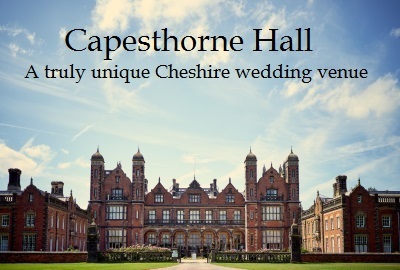 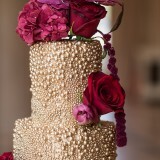 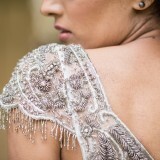 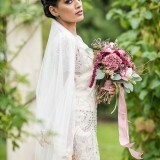 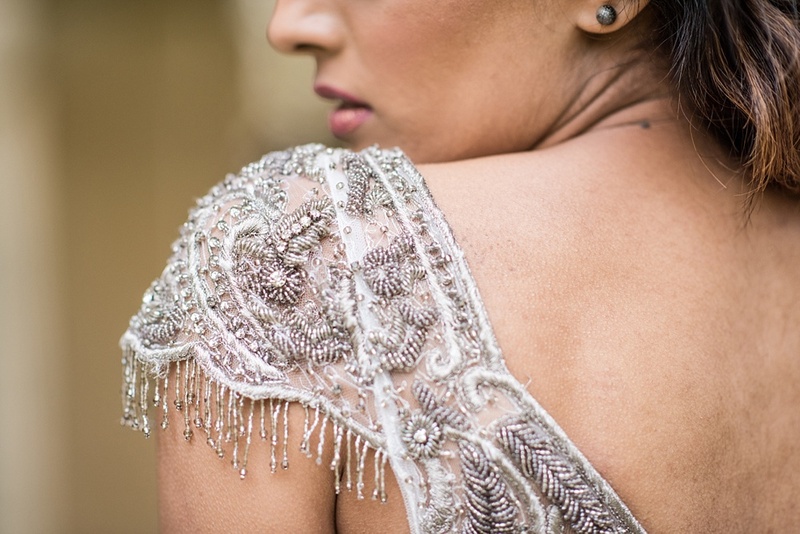 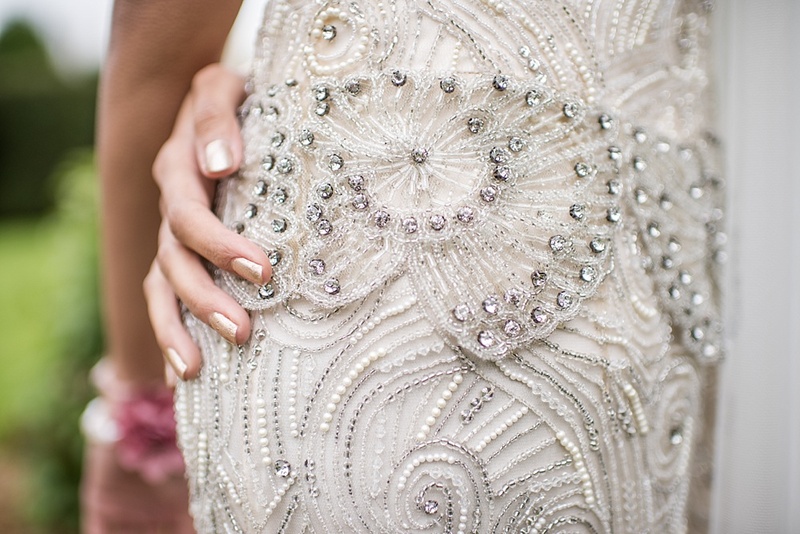 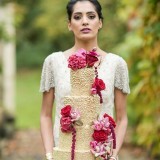 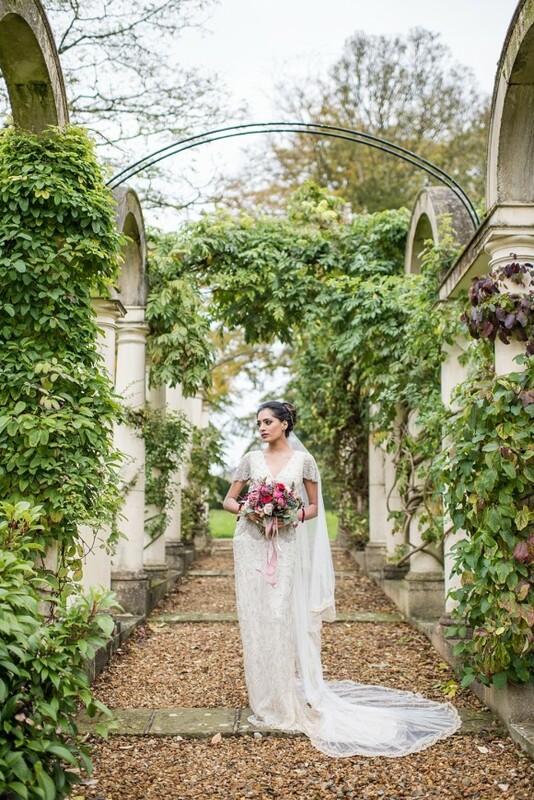 The dresses beautifully complemented the accessories we at Bespoke Vintage Castle provided. 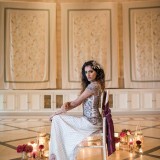 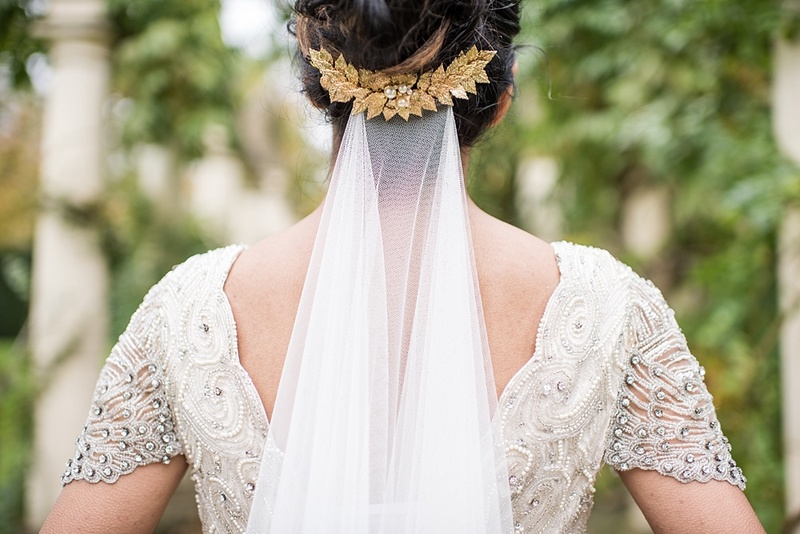 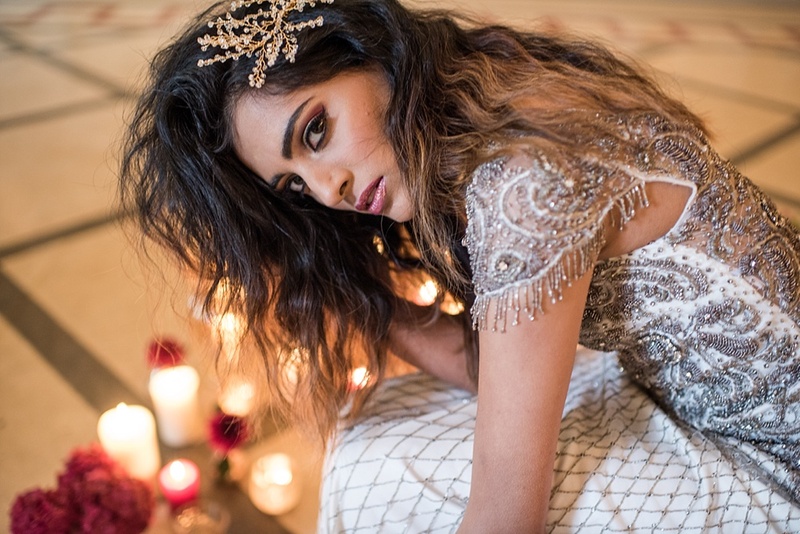 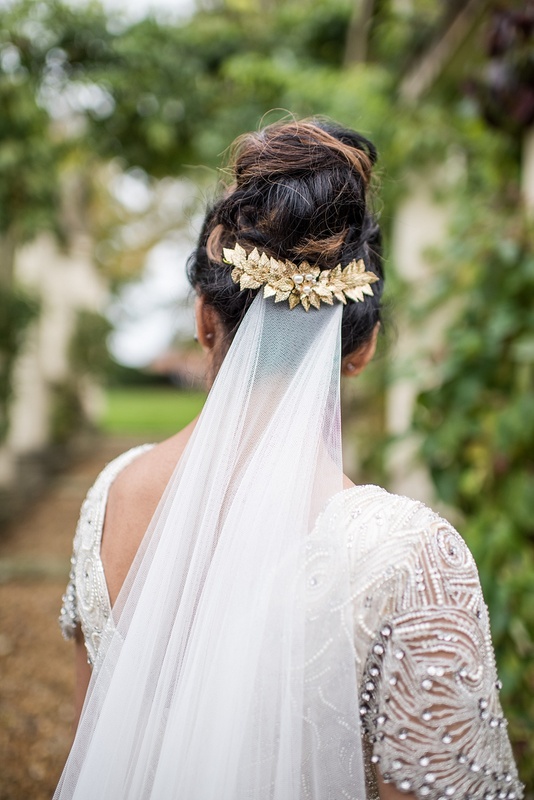 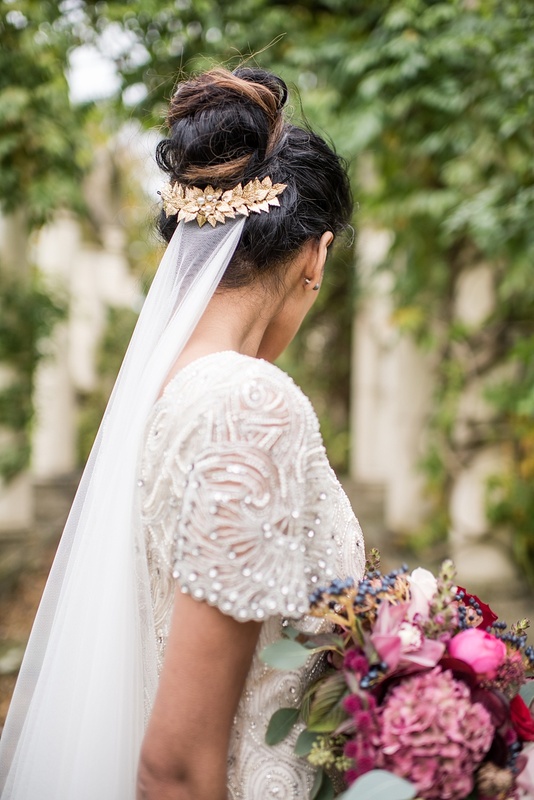 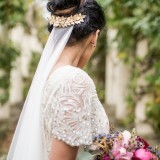 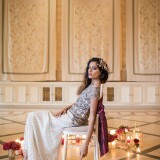 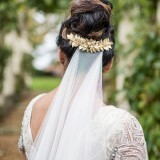 We specially designed a collection of golden leafy laurels and impeccable Swarovski headpieces exclusively for the shoot. 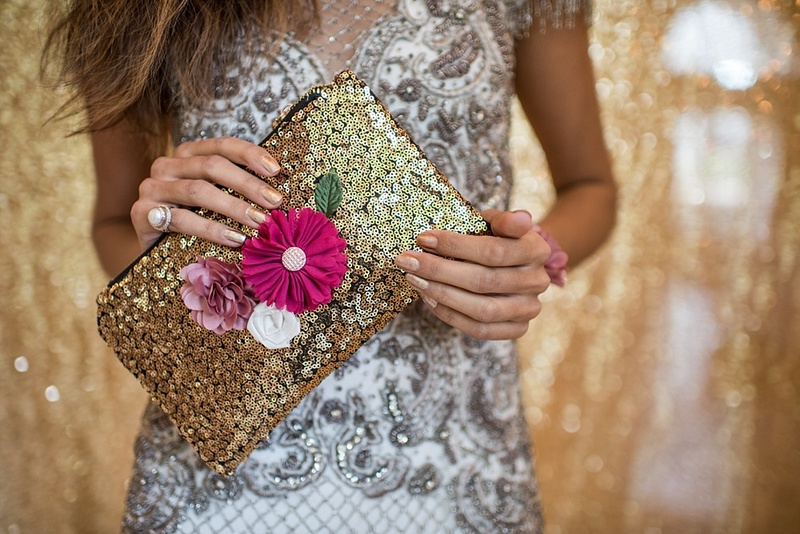 I also designed a clutch purse, which worked perfectly with the colour theme and added a hint of festive sparkle. 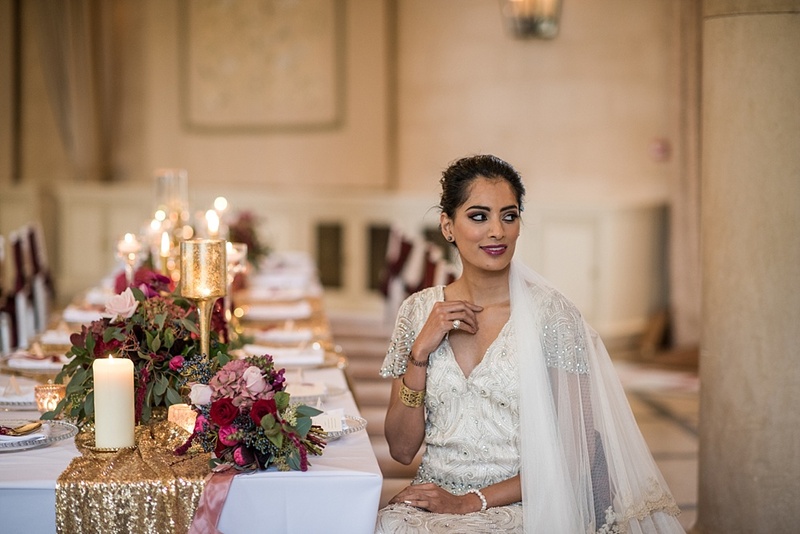 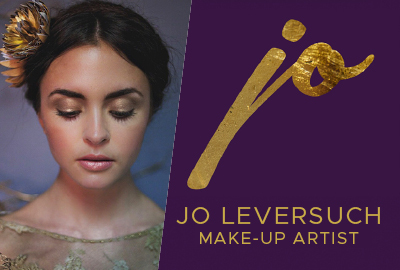 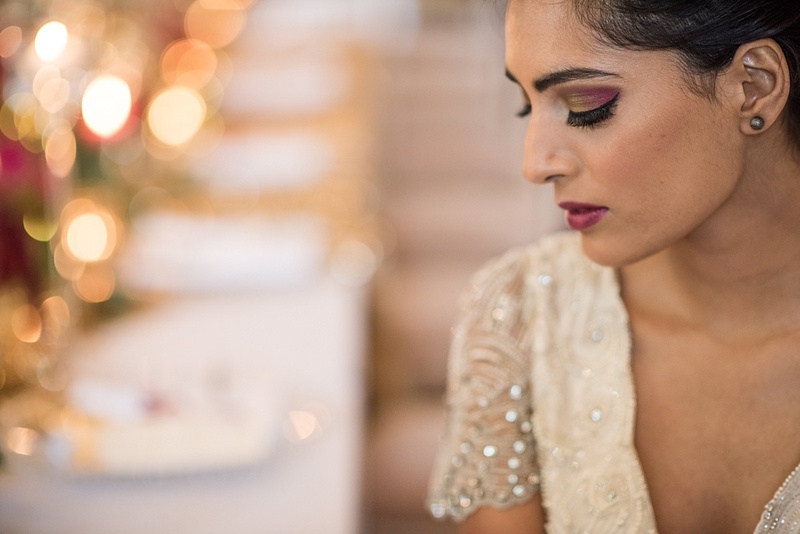 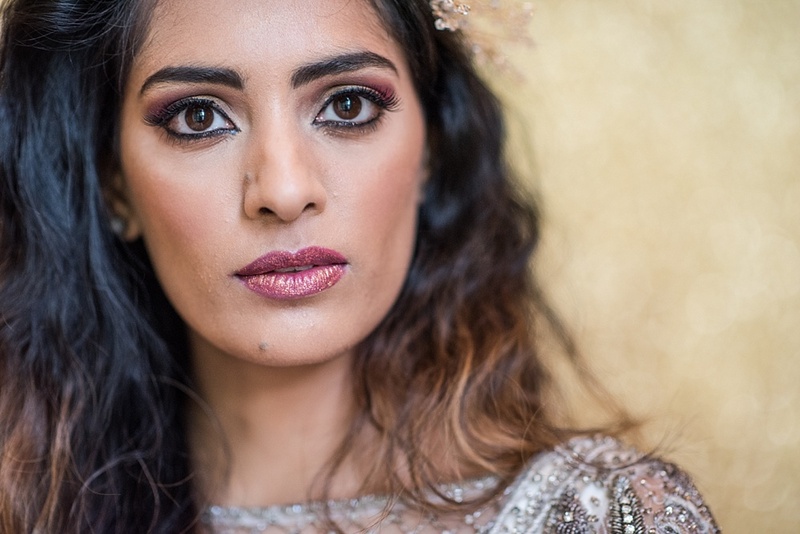 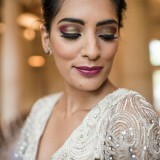 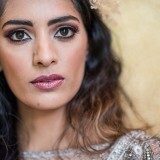 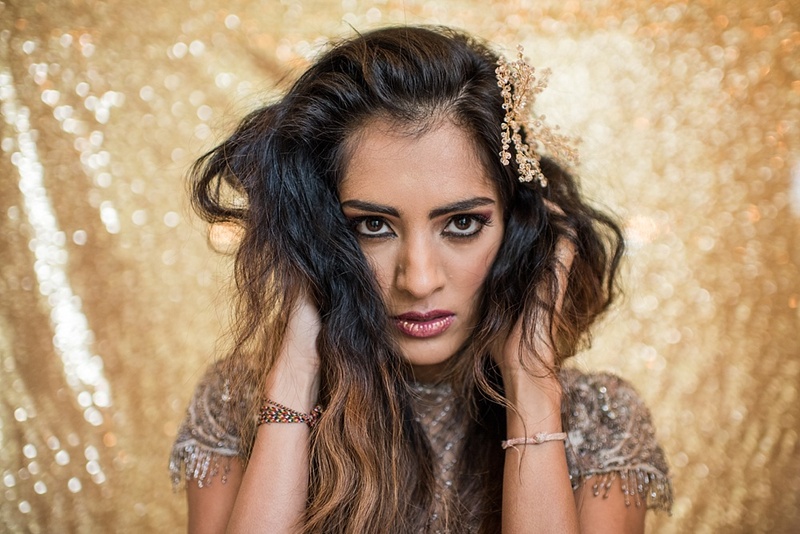 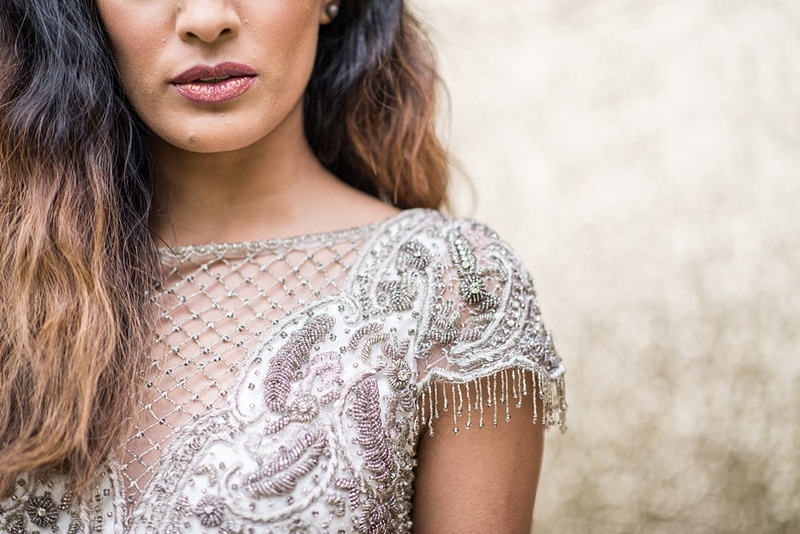 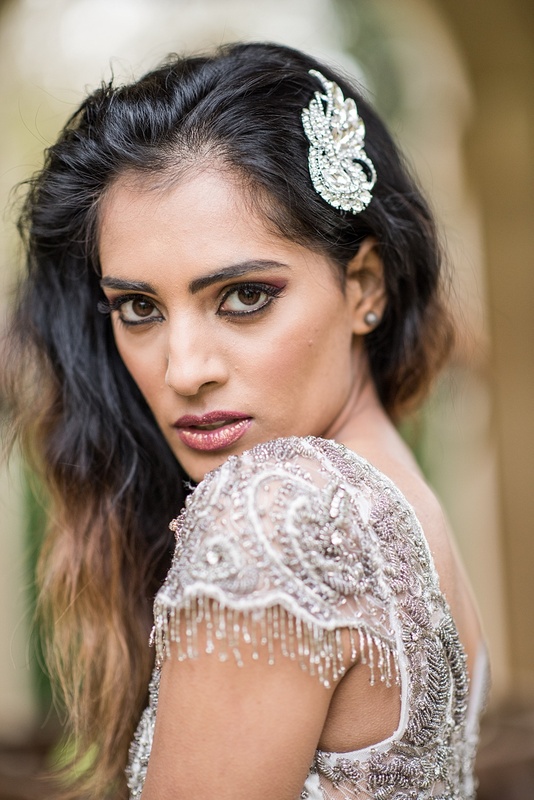 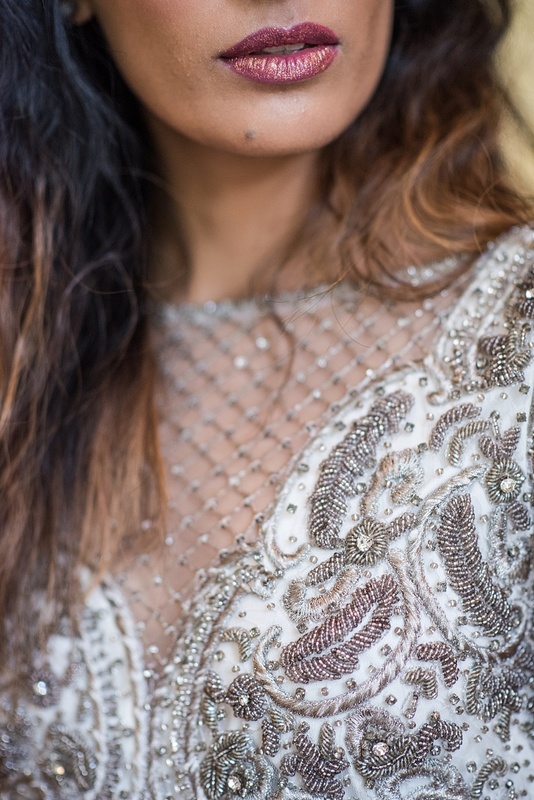 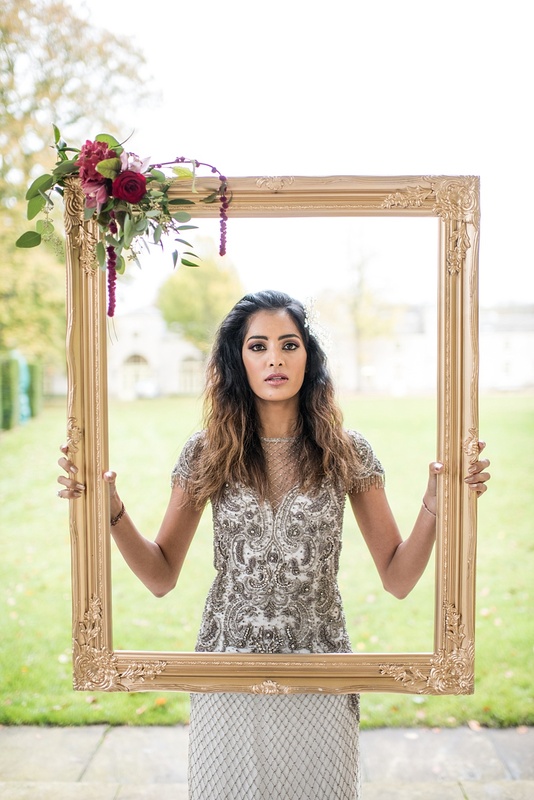 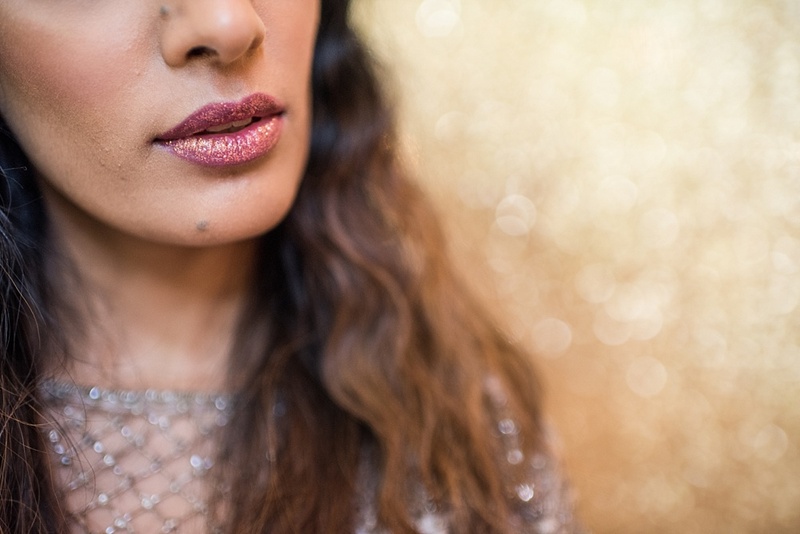 Along with the Eliza Jane Howell gowns and Bespoke Vintage Castle accessories, we wanted makeup and hair to match the glamour and feel of Christmas. 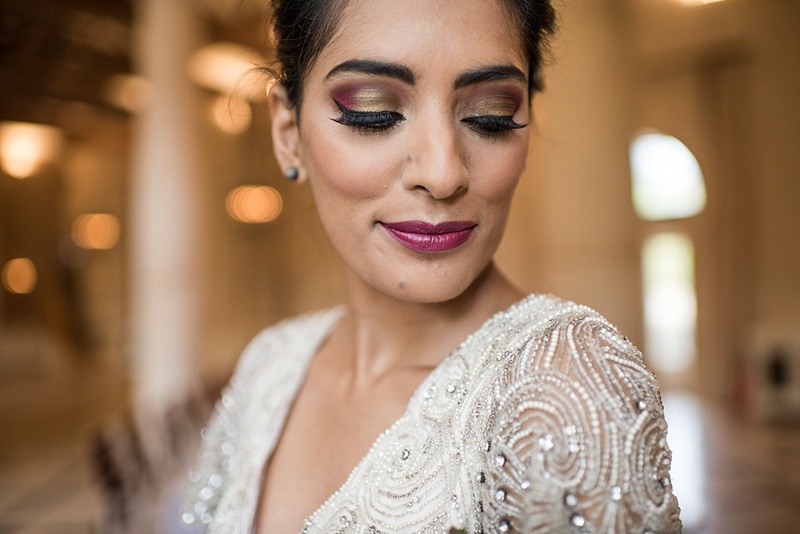 Channelling a subtle sense of old Hollywood glamour, we looked to Smink Makeup to achieve this – the expert in creating this look, with a luxurious golden palette for the eyes, deep plums and reds for the lips and a relaxed bridal up-do and a down look for later, with a crimped finish in our model’s golden copper highlights. 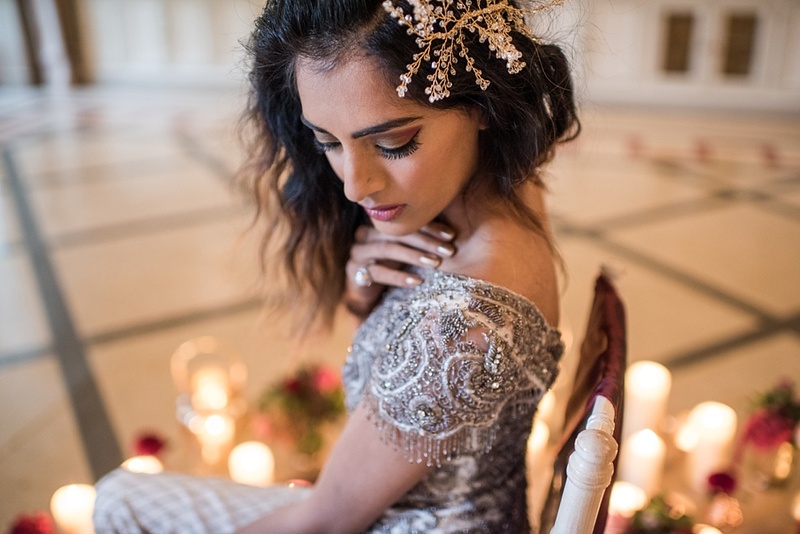 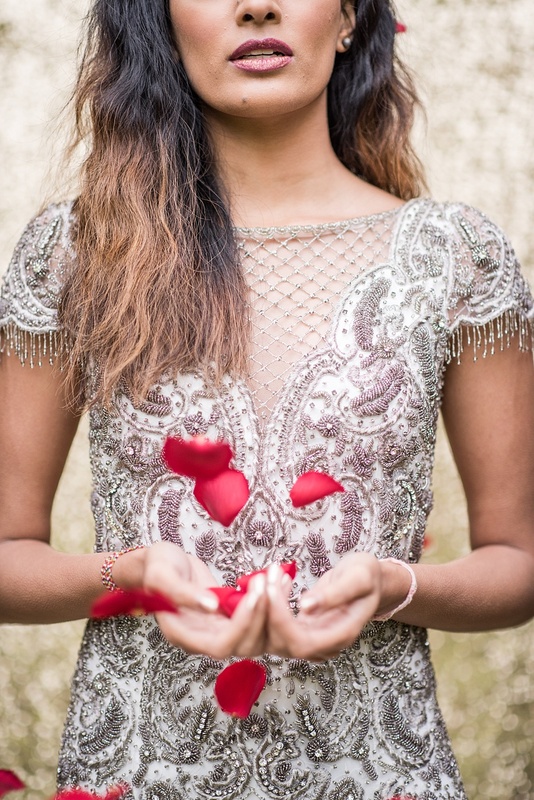 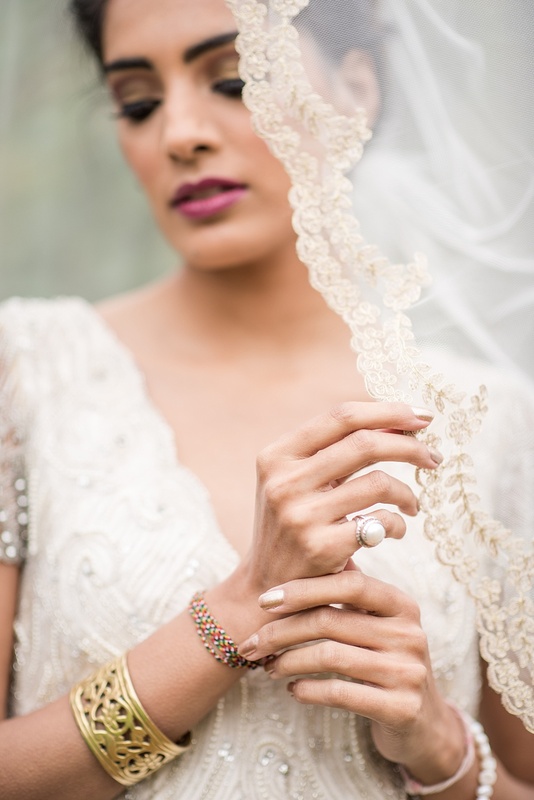 The model’s nails were painted gold and her wrists were adorned with freshwater pearl bracelets, also provided by Bespoke Vintage Castle. 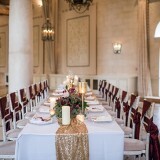 The day was an absolute success. 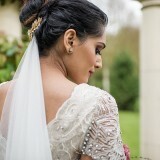 We achieved all the looks we wanted and the weather was light and dry. 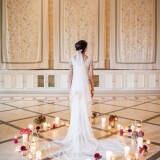 When planning the shoot, we had decided to commence the day in the early morning. 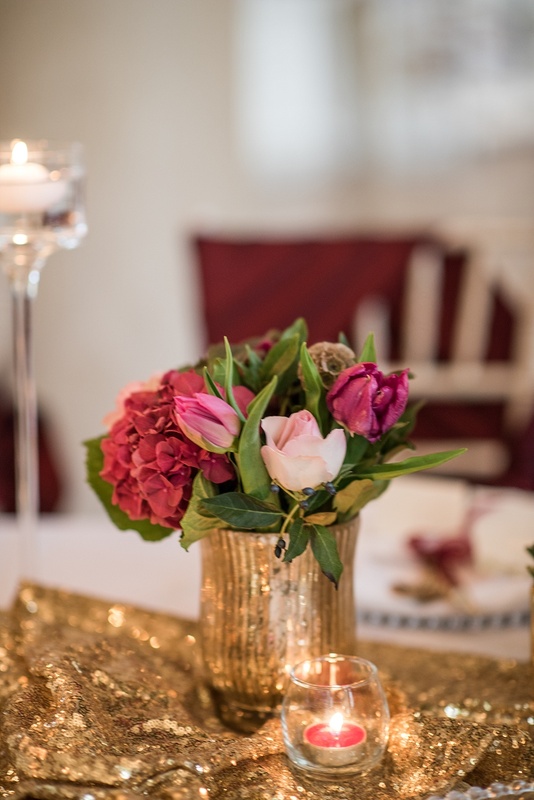 This way we overcame the challenges of losing winter light and, as it settled into early afternoon, we added the cosy and beautiful glow of candlelight to bring warmth and extra light. 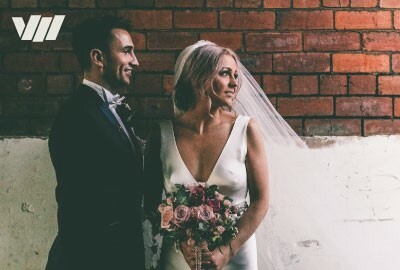 Working with a team of dedicated local professionals really enabled us to enjoy the day to the full, showcasing the very best northern talent and capturing all the images we needed. 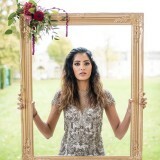 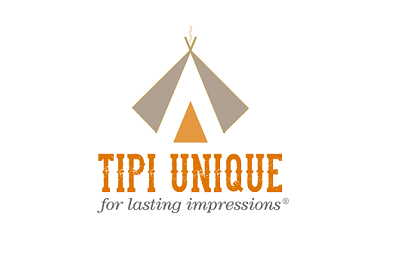 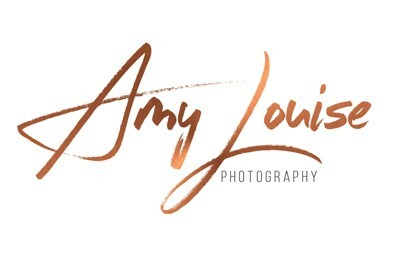 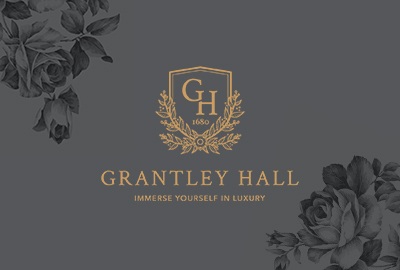 Look out for more beautiful, themed photoshoots from this team in the coming year, set in the heart of Yorkshire. 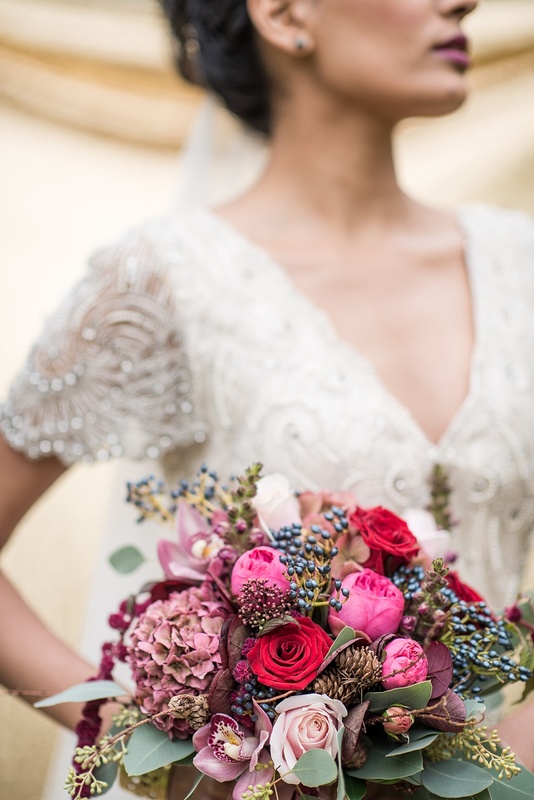 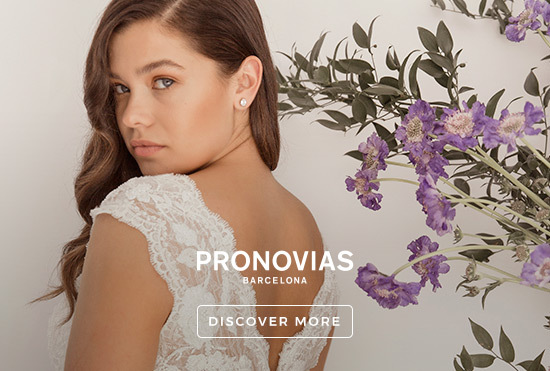 We are very big on trends and would love to inspire all brides with a fabulous look for 2018, showcasing the Pantone colour of the year: Ultra Violet.